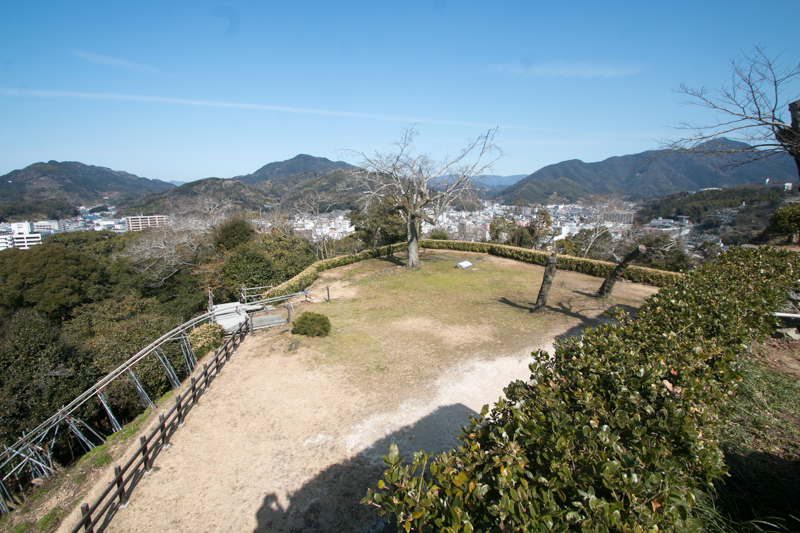 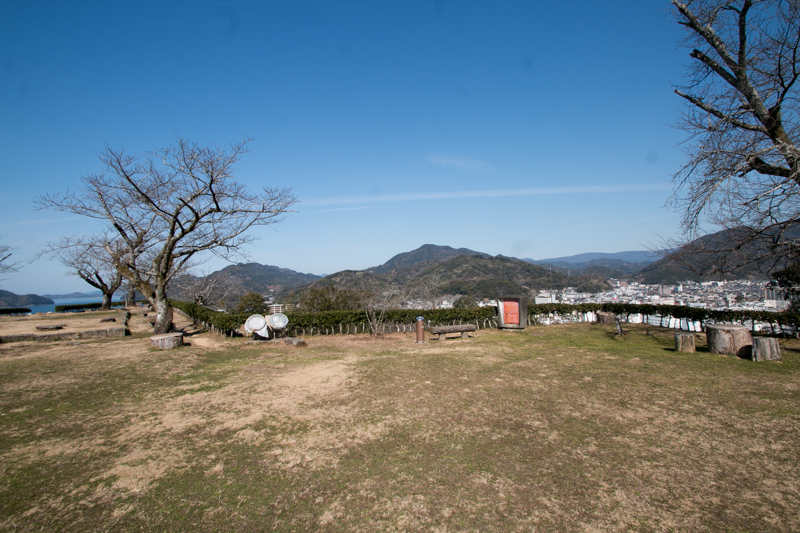 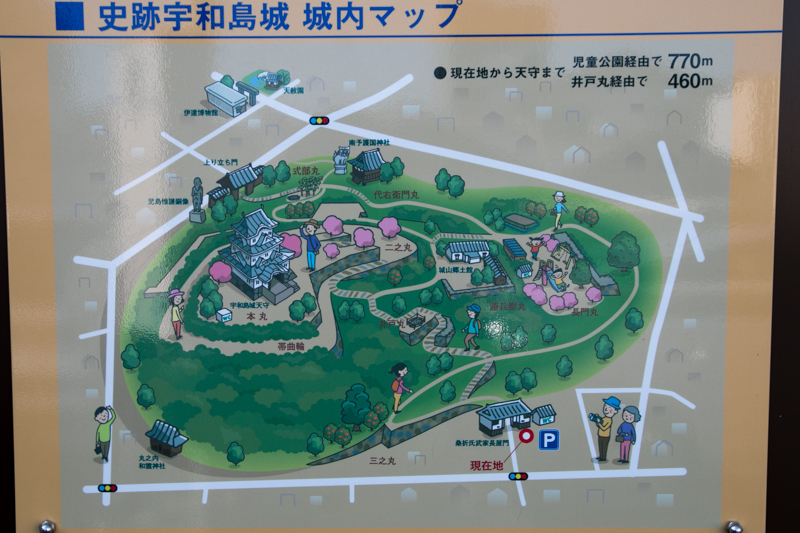 Uwajima castle (宇和島城) is located on a hill at the center of Uwajima city. 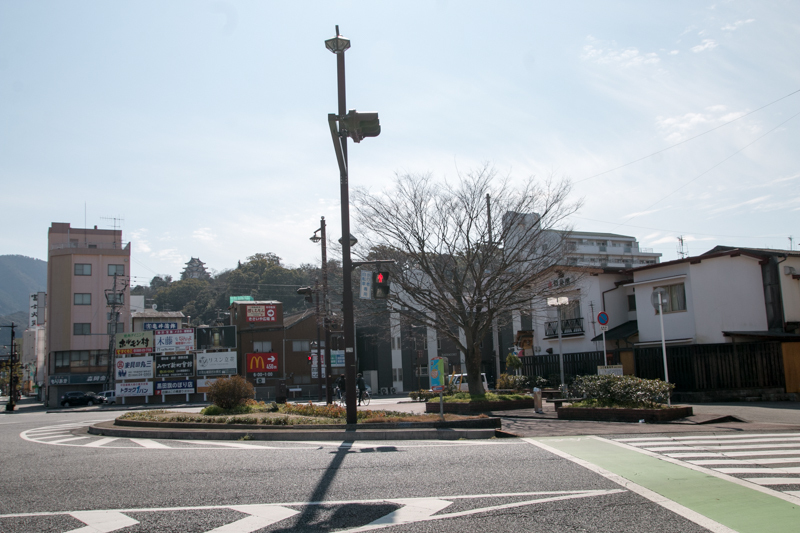 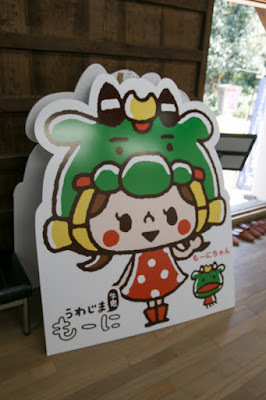 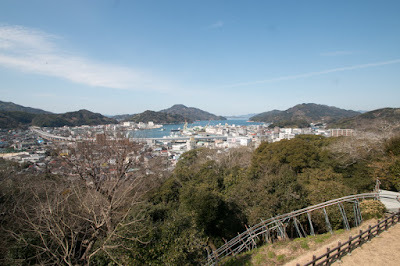 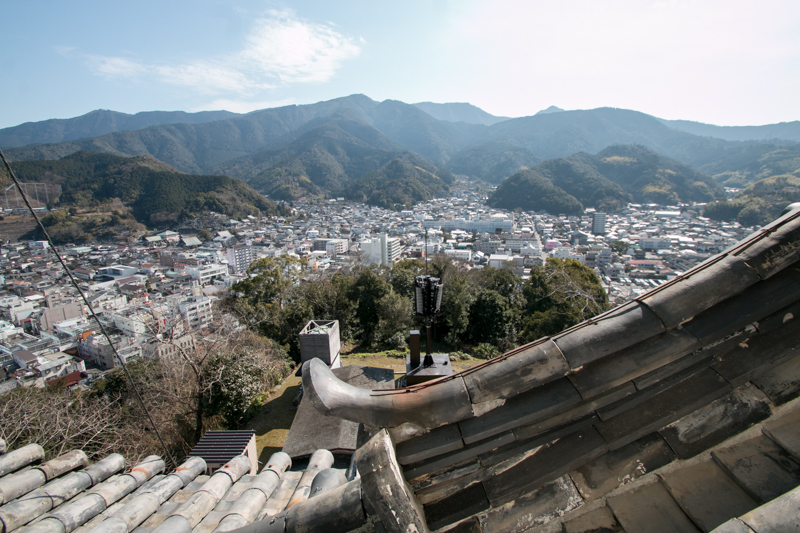 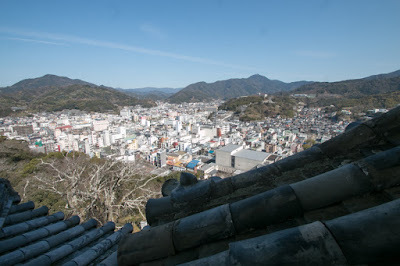 Uwajima city has been a center of southern part of Iyo province (Ehime prefecture), having good poat and road to western part of Tosa province (Kochi prefecture). 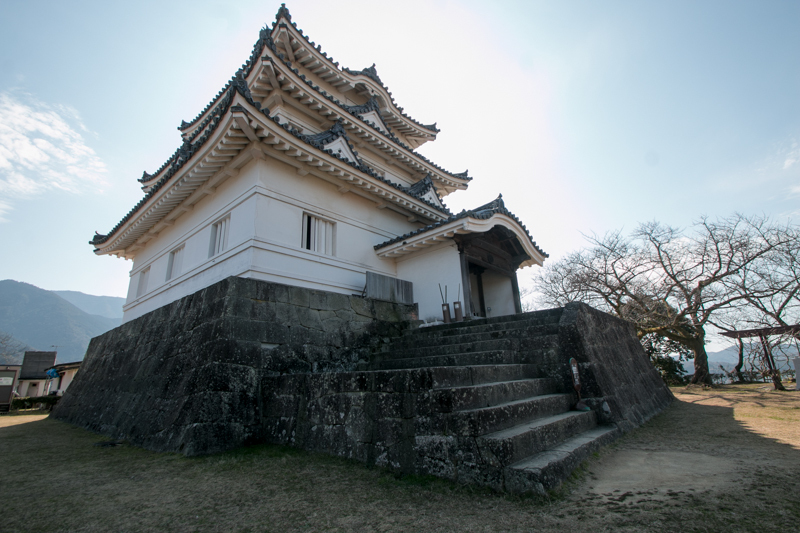 Now the castle was apart from seashore, but this is due to land reclamation and formerly three dimensions of this castle were surrounded by sea. 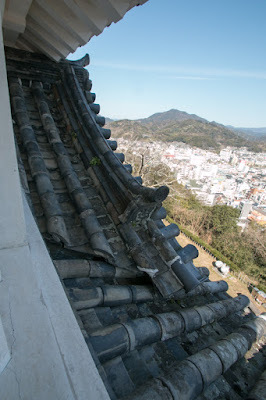 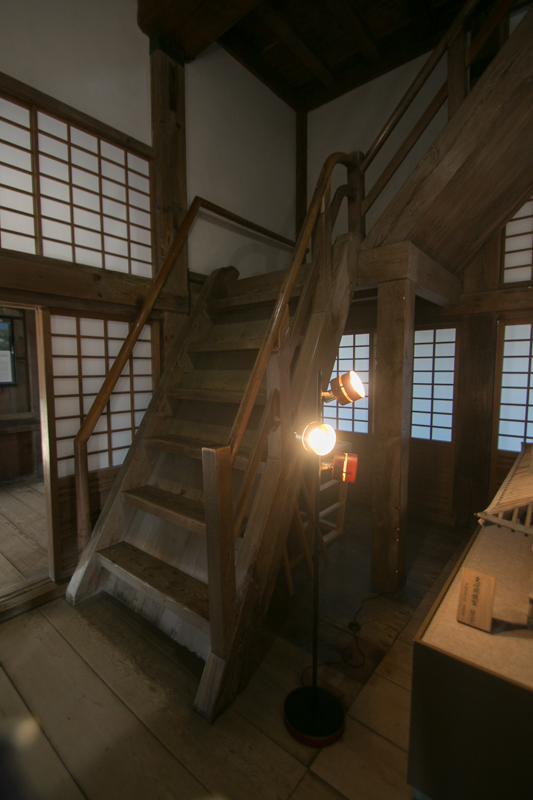 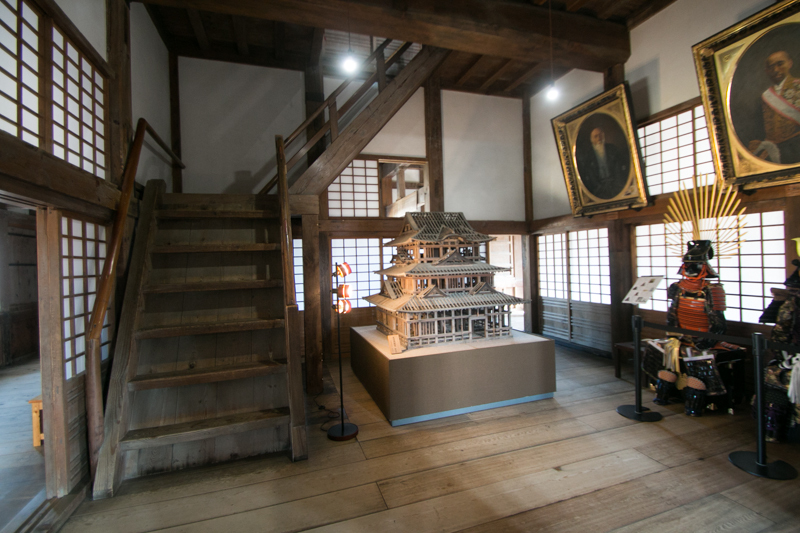 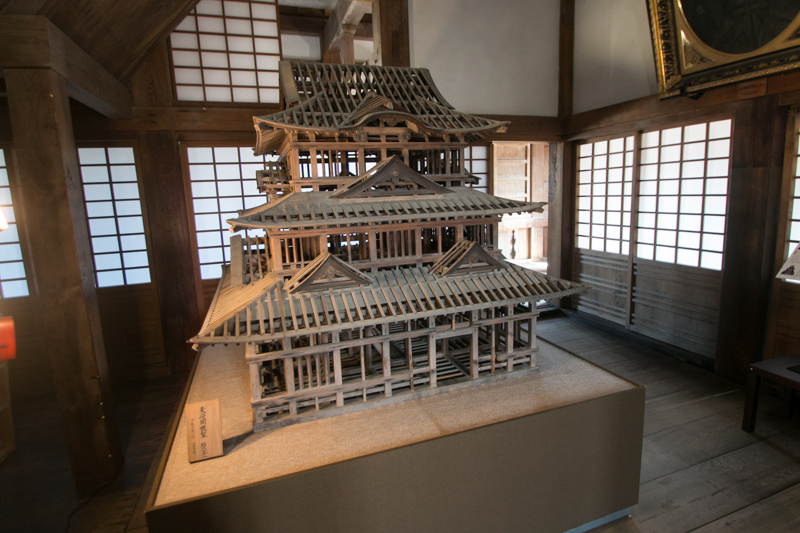 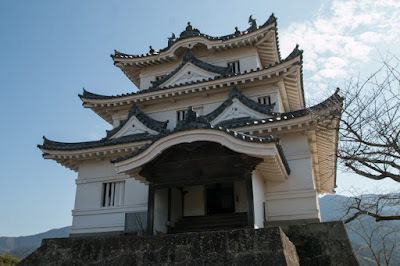 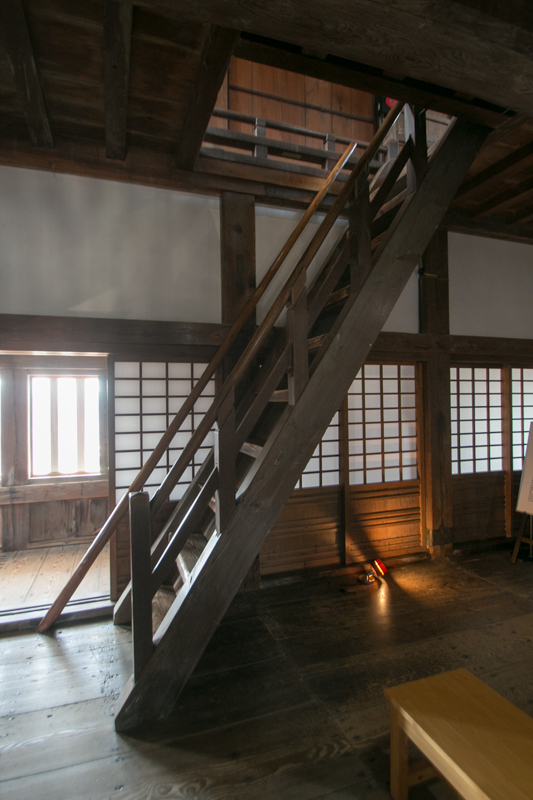 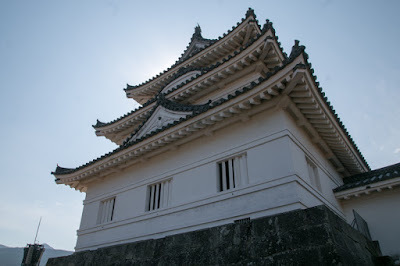 Uwajima castle is one of 12 castles having original main tower (Tenshukaku), and this three story main tower is small but elegant one with pure white walls and decorated roofs on each floor. 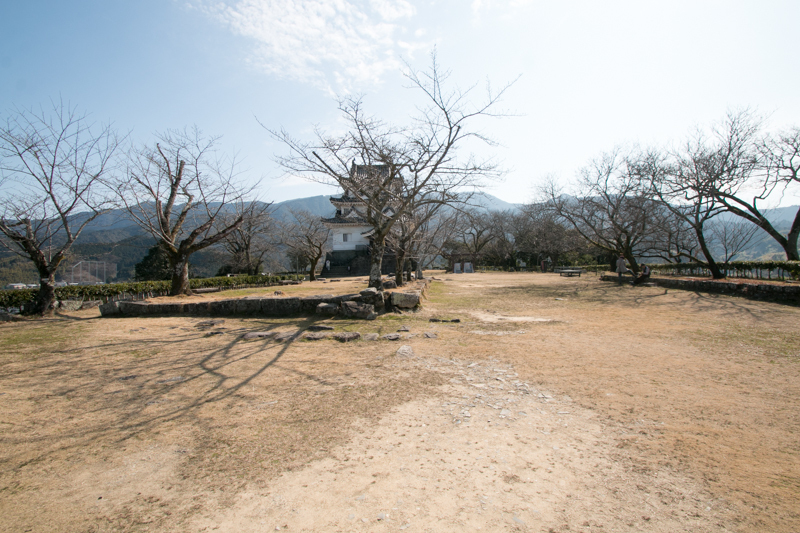 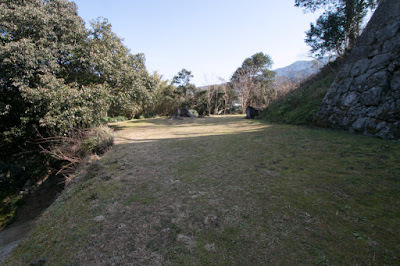 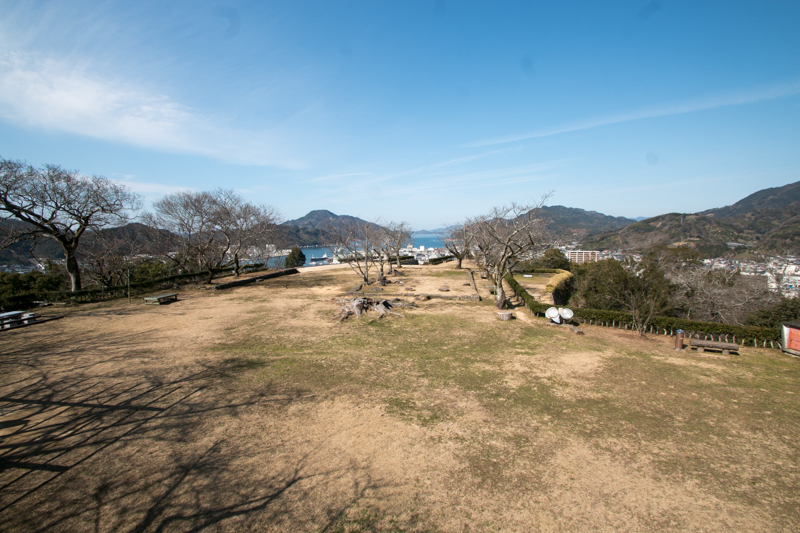 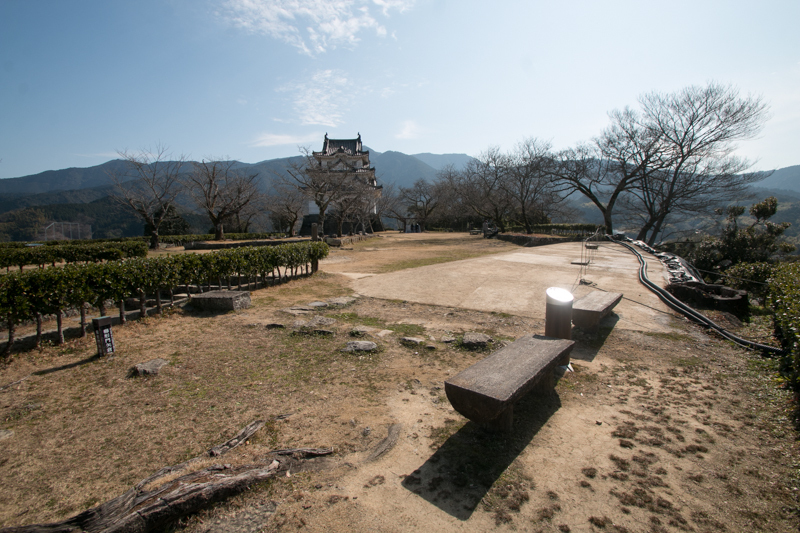 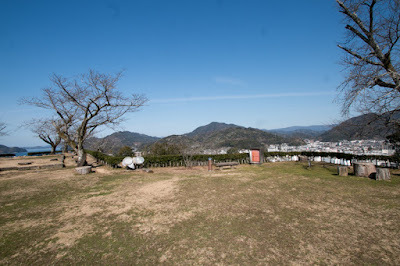 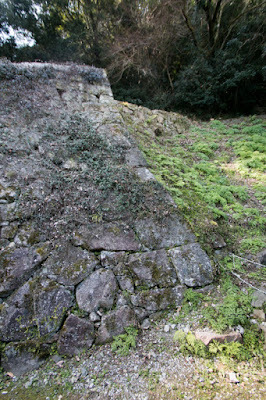 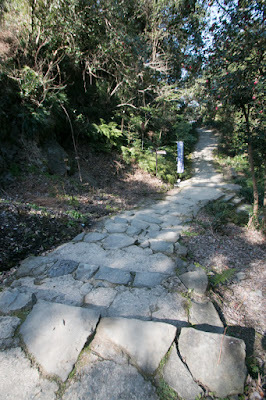 Historically there was a small named Marukushi castle in this place. 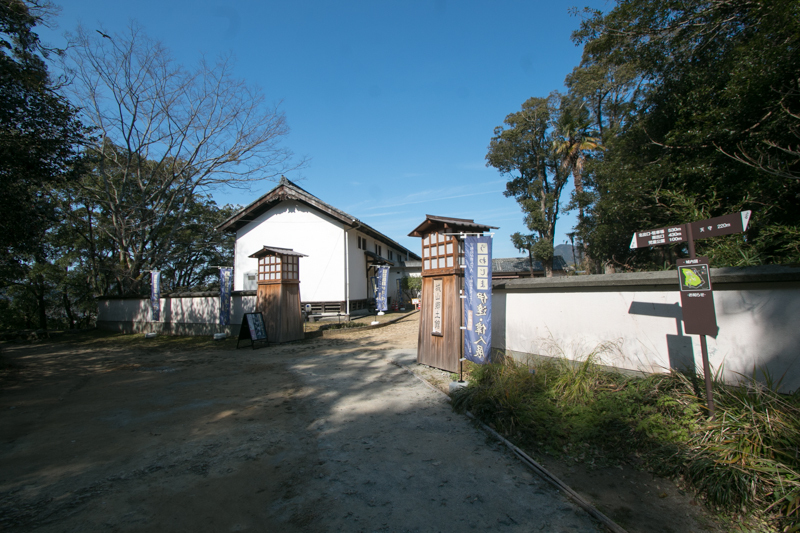 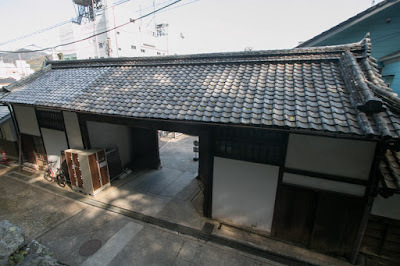 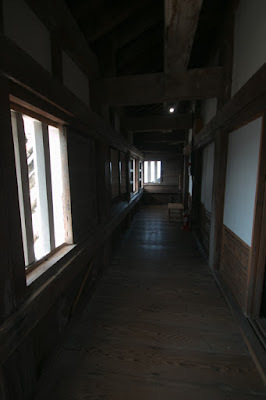 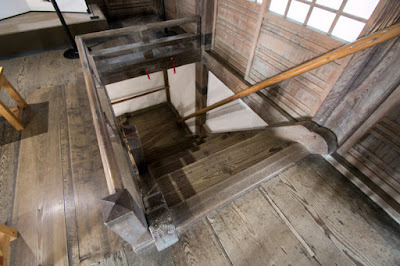 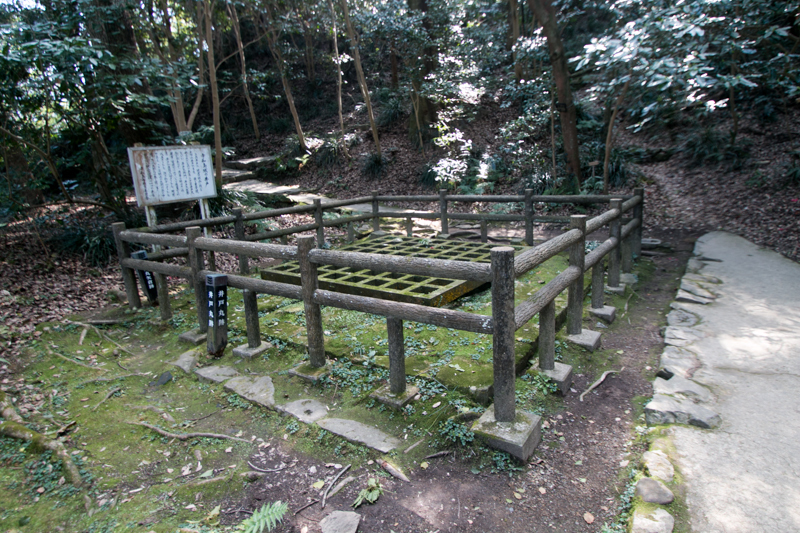 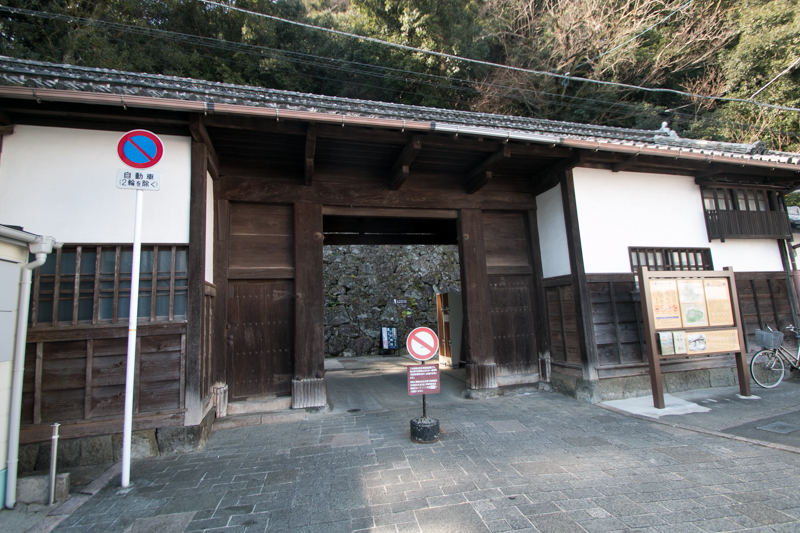 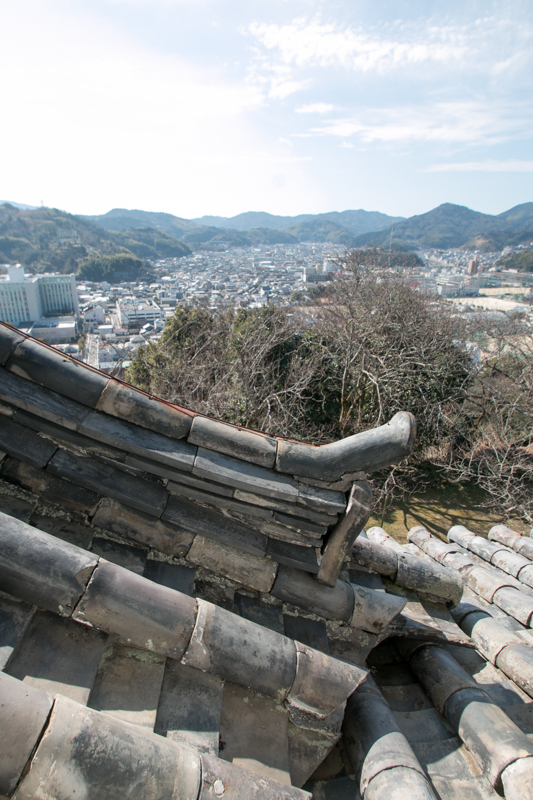 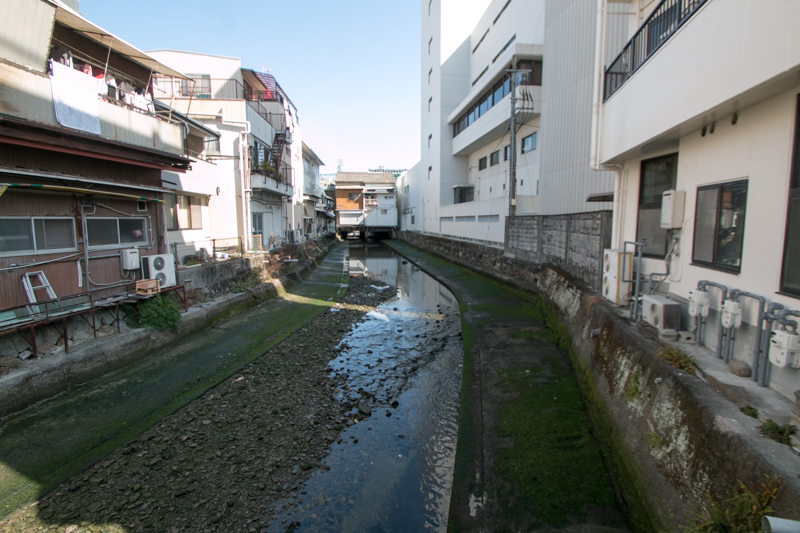 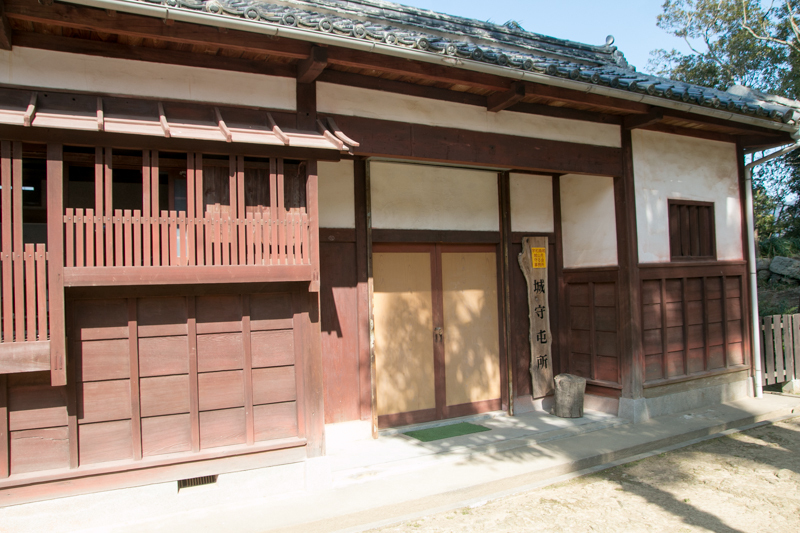 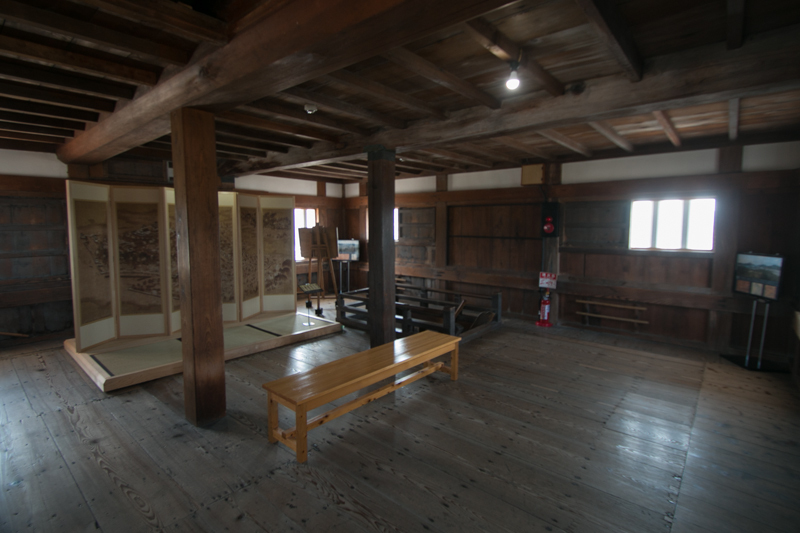 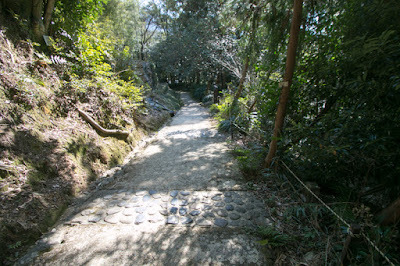 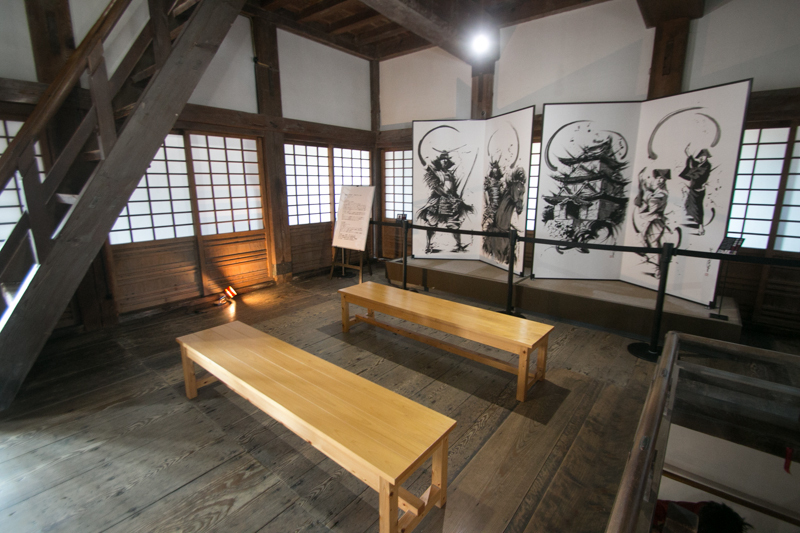 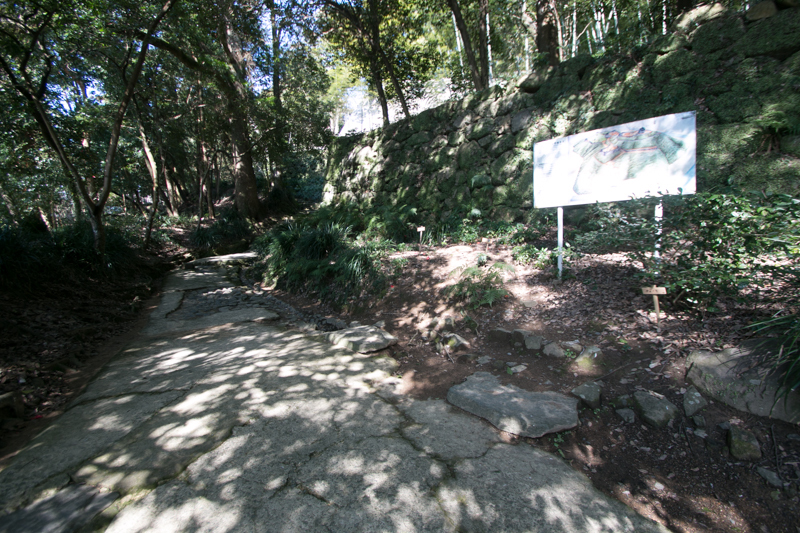 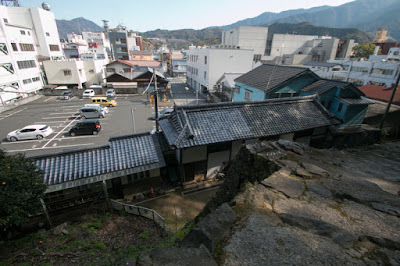 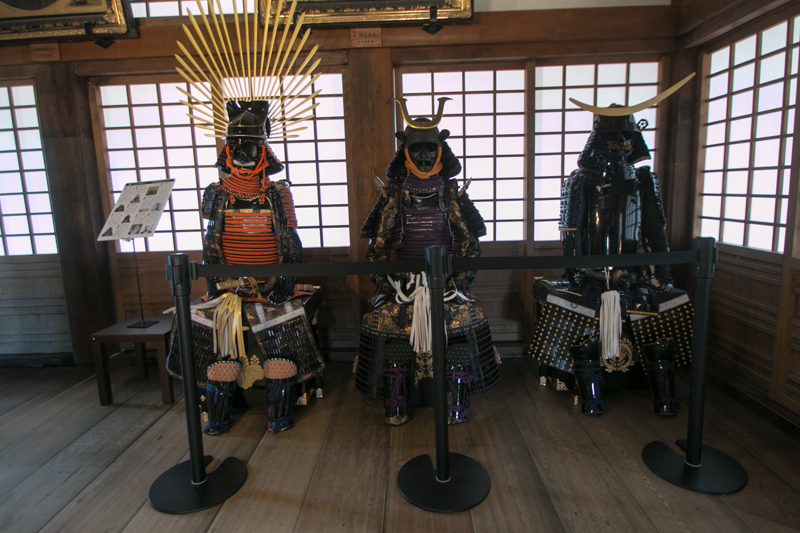 In Muromachi period, Uwajima area was goverened by Saionji clan, a local lord. 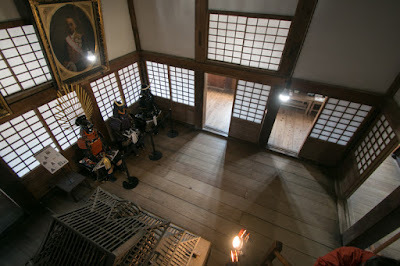 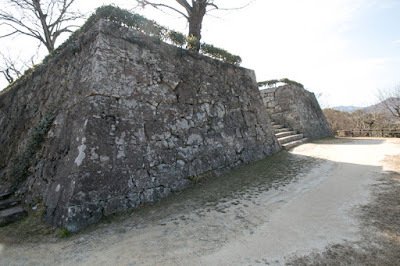 Saionji clan kept conflict with Utsunomiya clan at Ozu castle (Ehime prefecture) or Kono clan at Yuzuki castle, but in 1584, Saionji clan was attacked by Chosokabe clan, a warlord of Tosa province continued unification battle of Shikoku island and extinguished. After the surrender of Chosokabe clan to central ruler Hideyoshi Toyotomi (1537-1598) in1585, Uwajima castle was once governed by Toda clan. 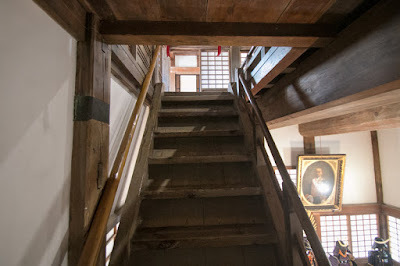 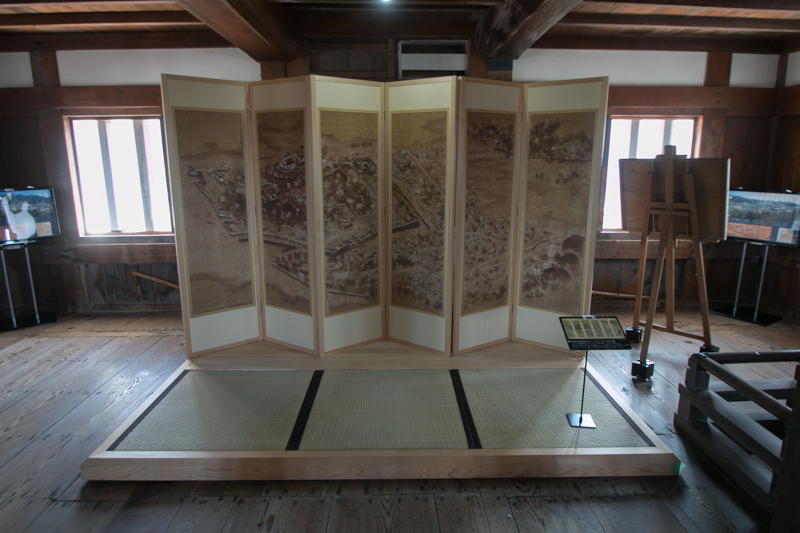 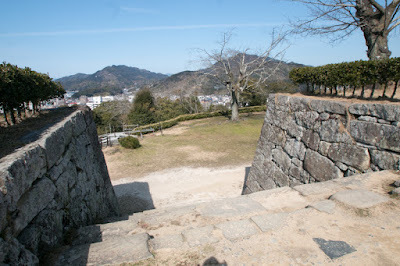 But in 1595, Taketora Todo (1556-1630) who was orignally a right-hand retainer of Hidenaga Toyotomi (1540-1591), the trusted younger brother of Hideyoshi, was appointed as the commander of Uwajima castle. 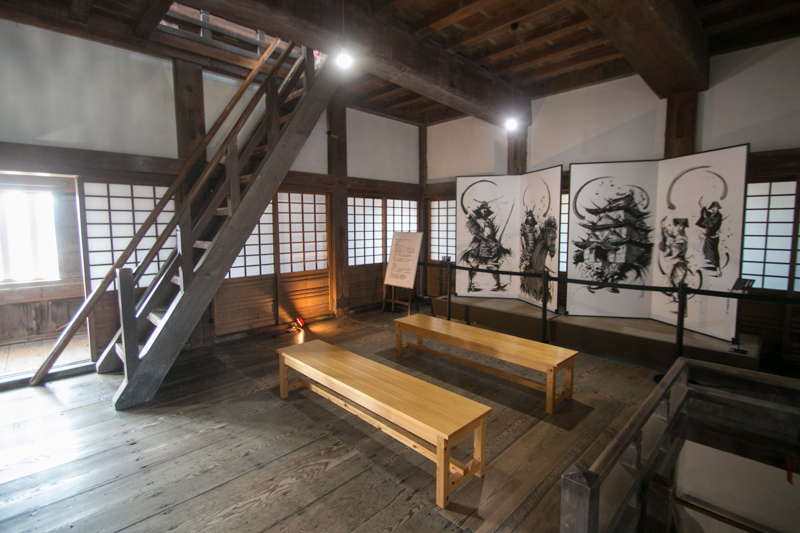 Facing at the master's death Takatora once intended to leave the world and become a monk, but Hideyoshi evaluated his talent and urged him withdraw it. 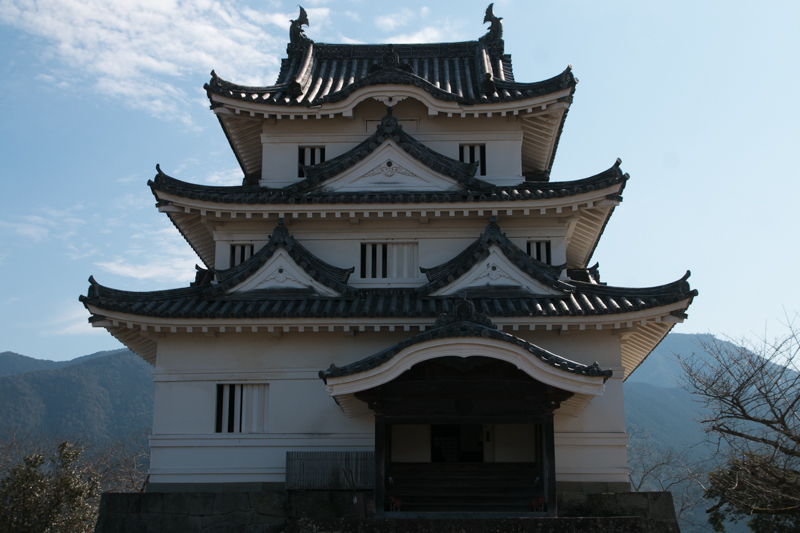 Takatora was a multi talent people good at tactics and administration, and expecially an excellent castle builder. Takatora significantly expanded Uwajima castle into a modern castle equipped a three story main tower and tall stone walls. 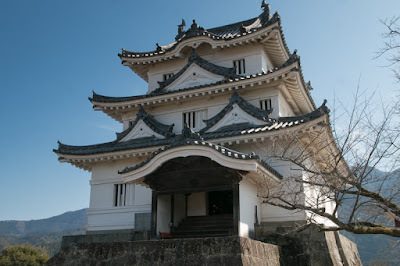 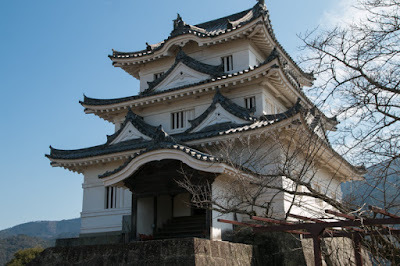 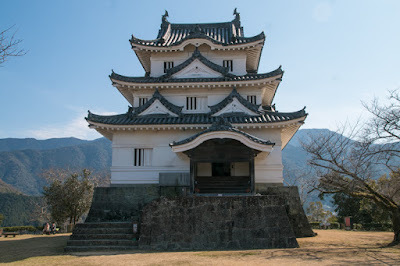 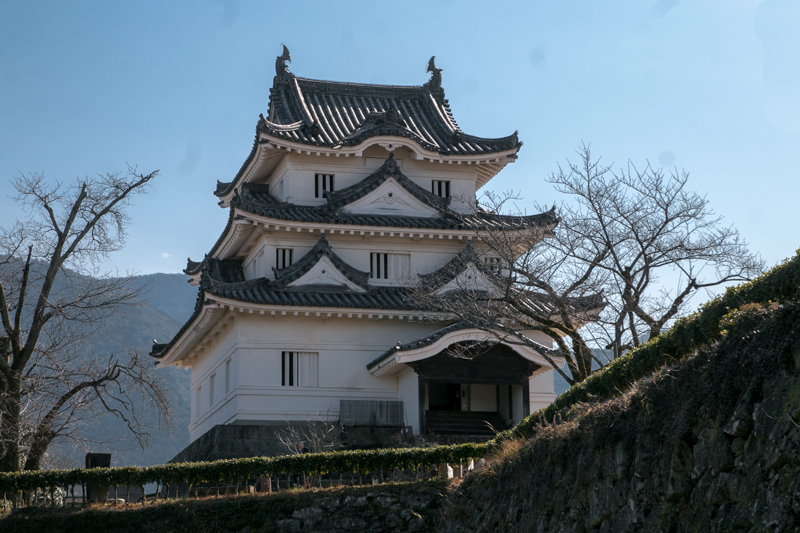 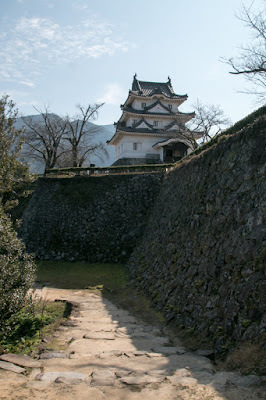 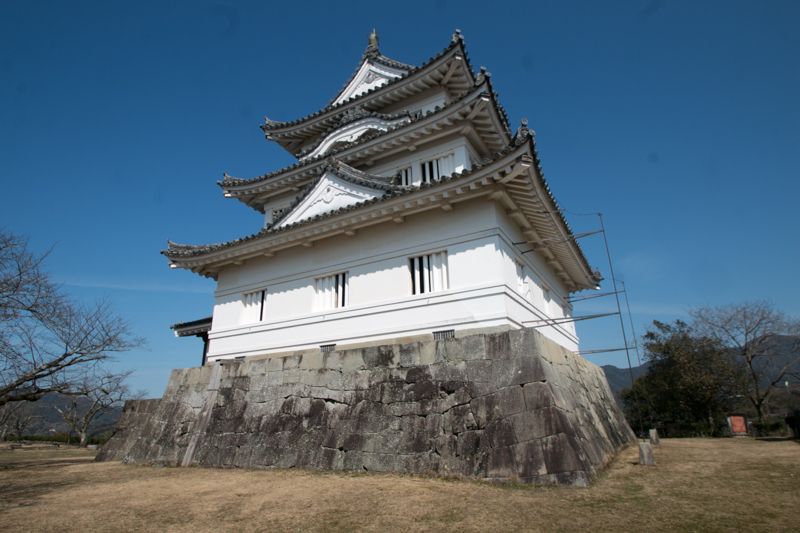 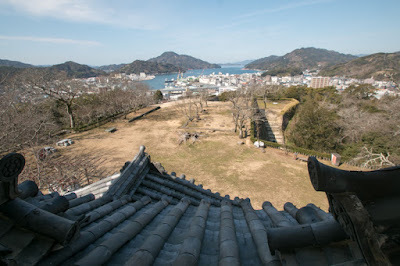 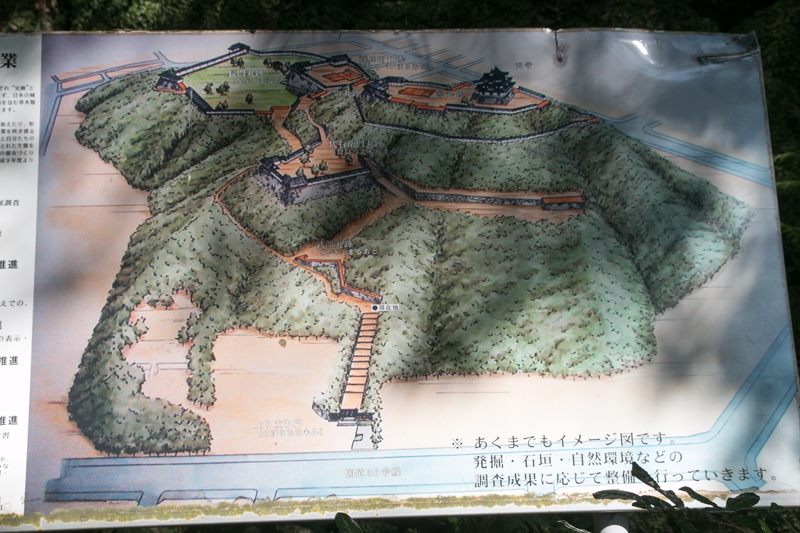 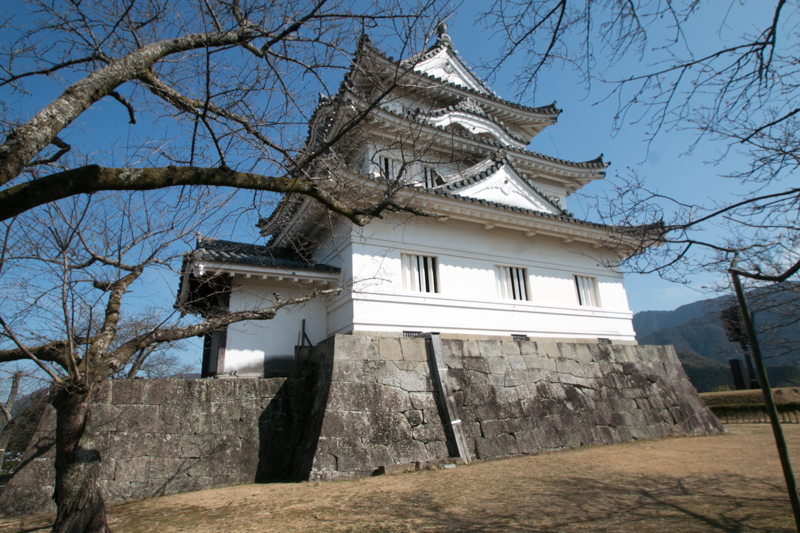 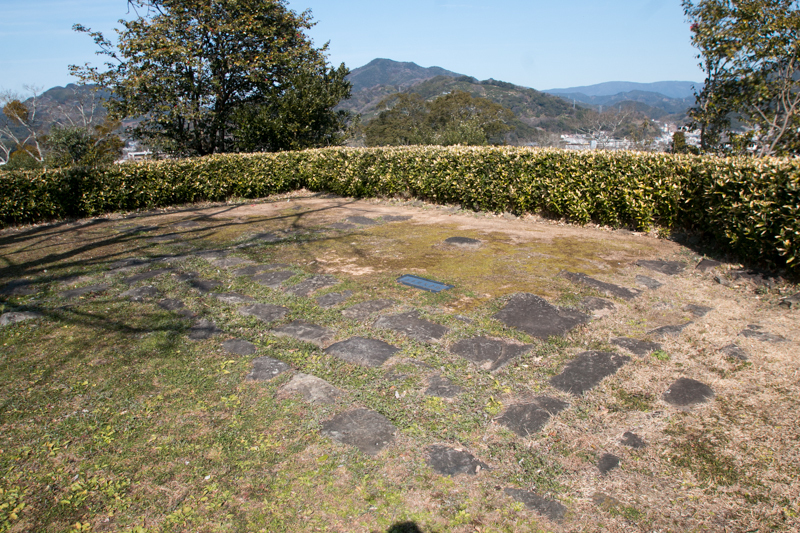 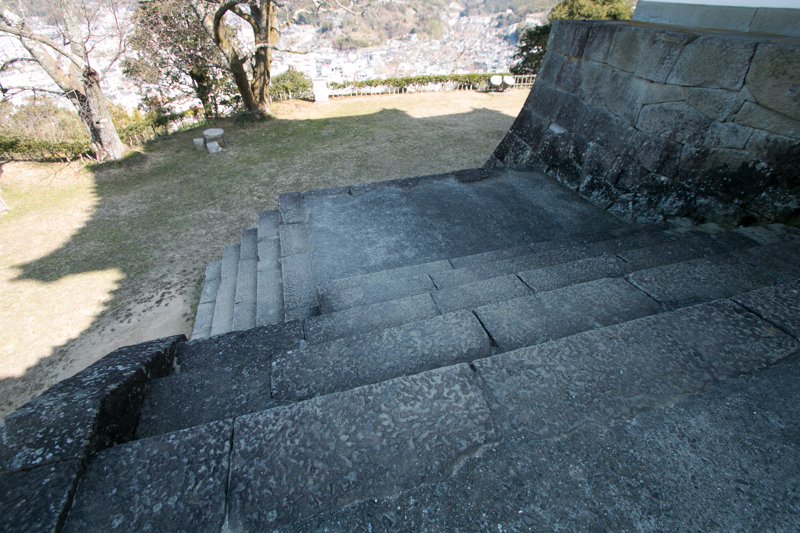 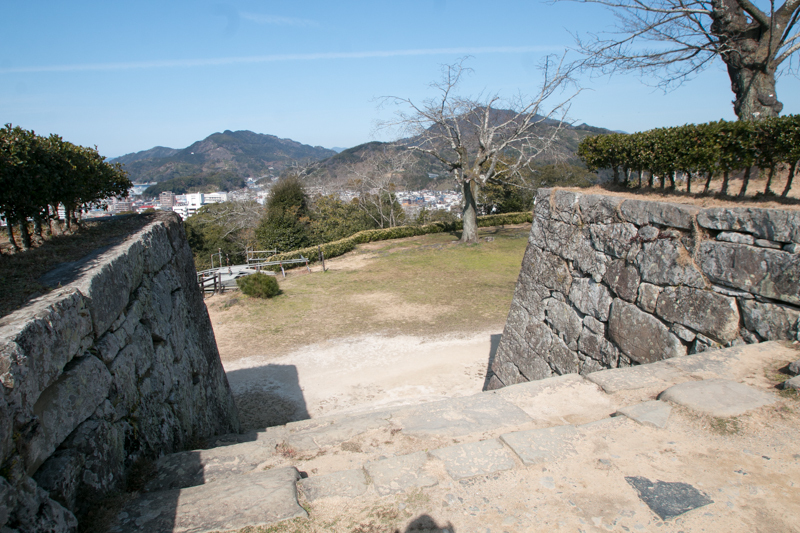 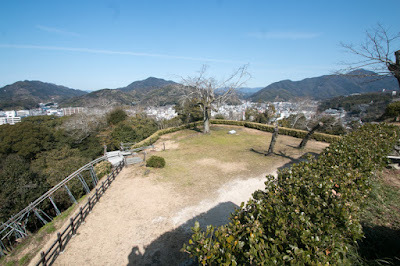 Later Takatora achieved Ozu castle next to Uwajima castle as a reward for brave fight at foreign expedition, and also reformed it into a large castle. 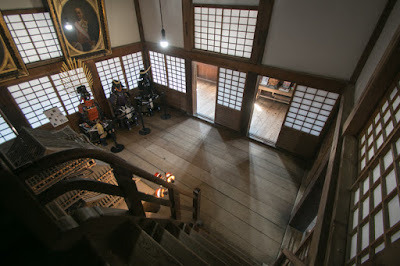 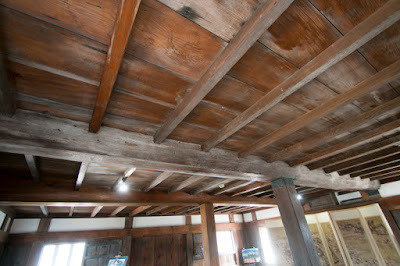 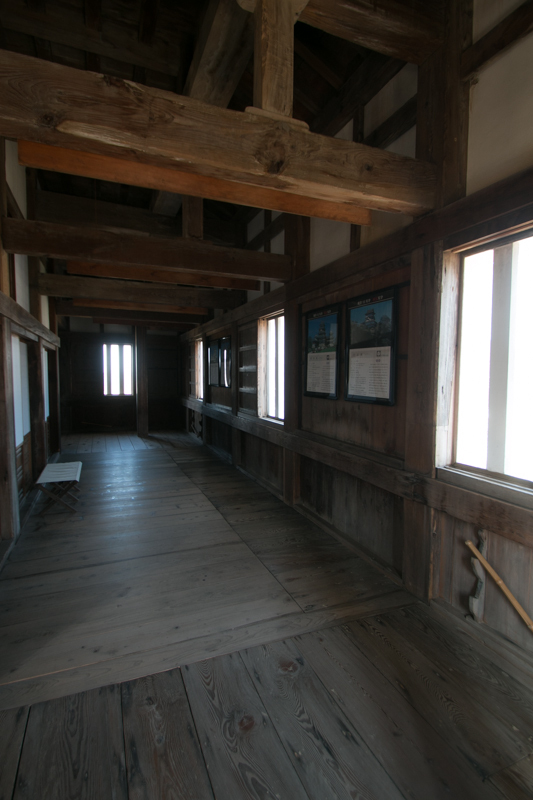 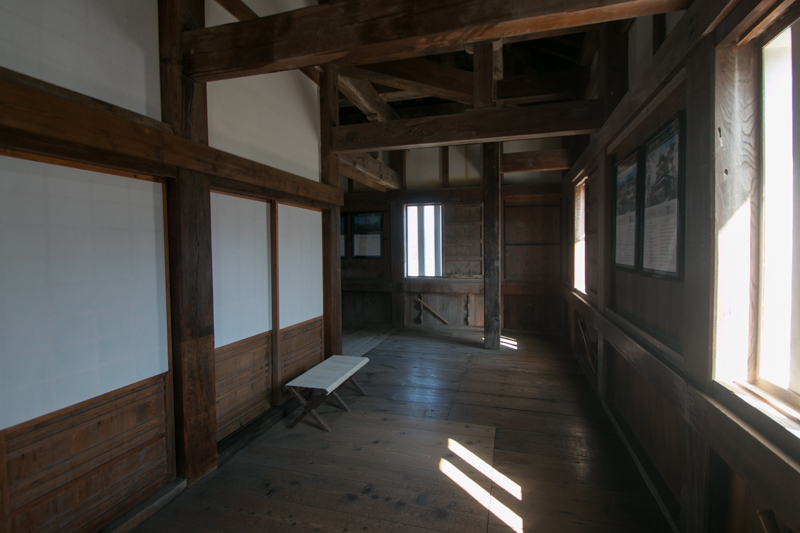 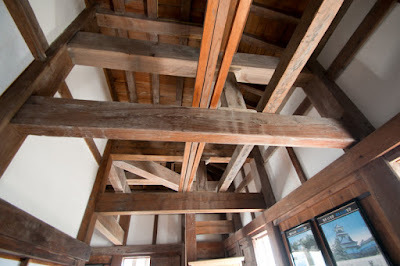 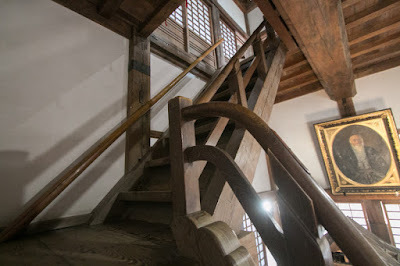 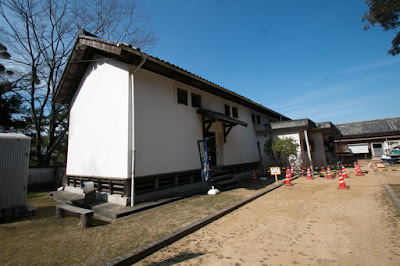 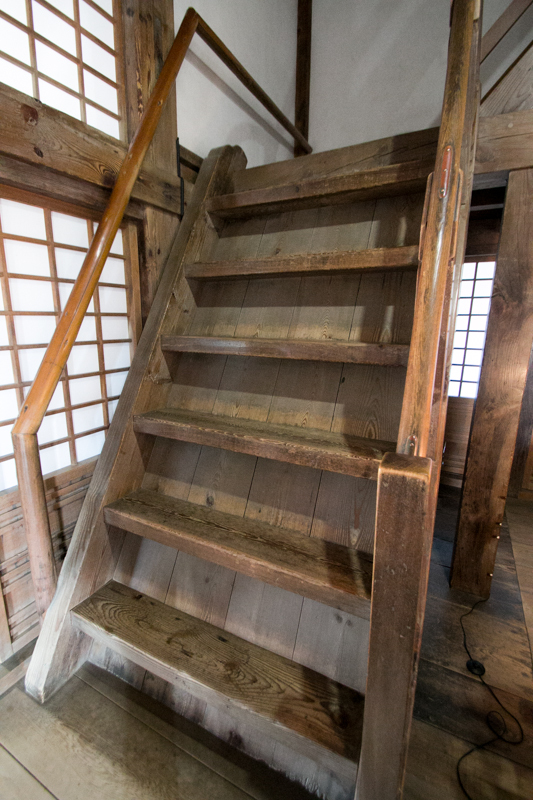 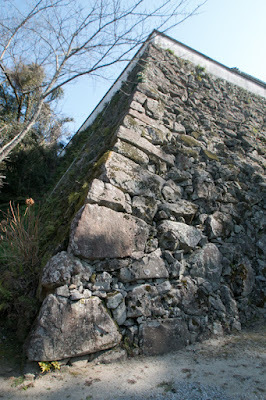 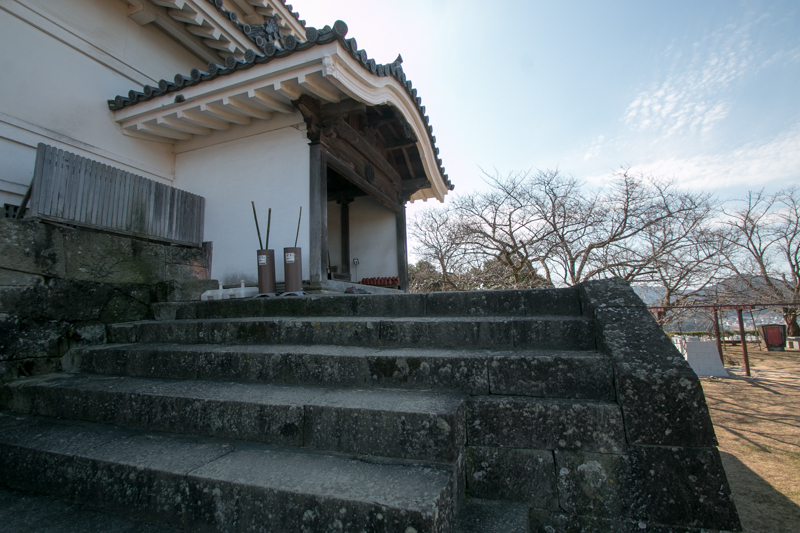 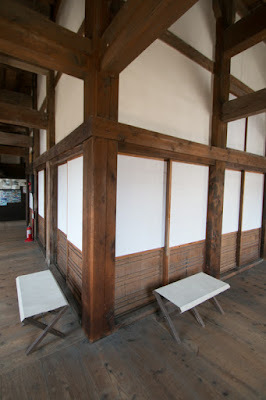 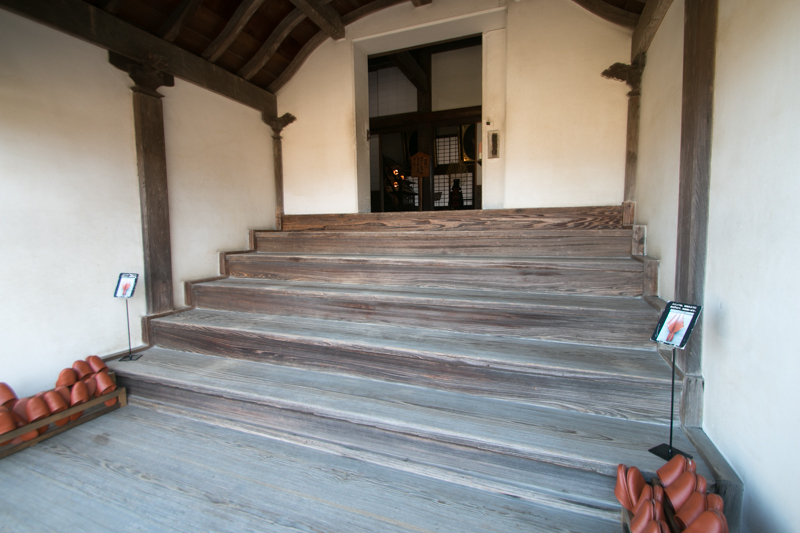 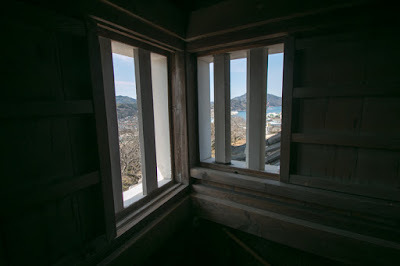 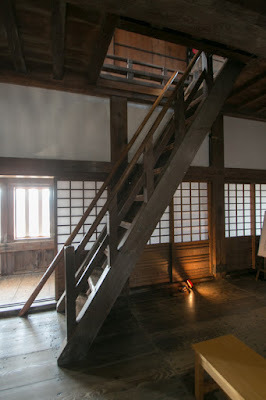 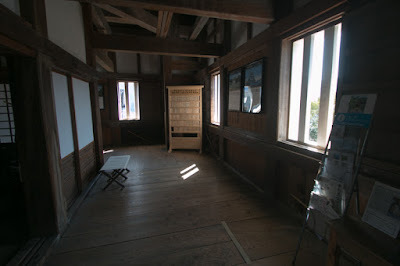 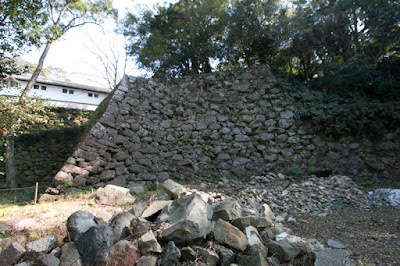 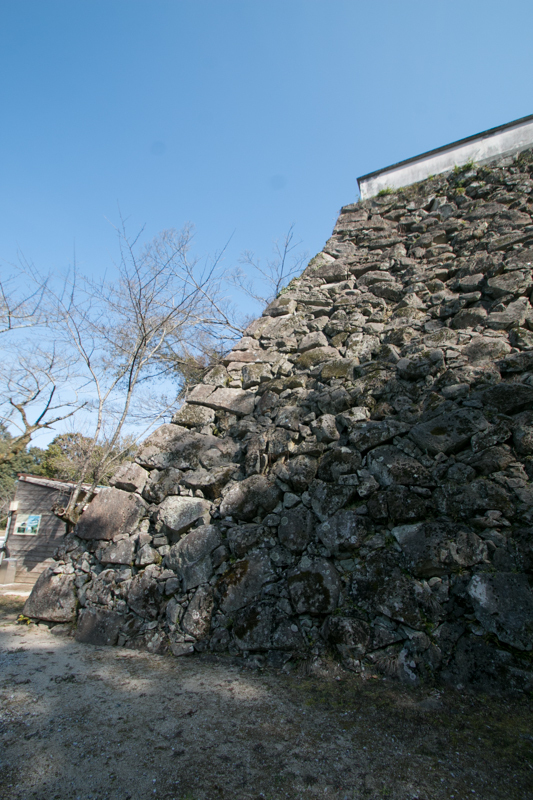 In spite of modern exterior, structure Uwajima castle still keeps medieval one. Central area is an oblong shaped area of 100 meter long and 30 meter wide, has a main tower on the basement isosatelly at the center of south half. 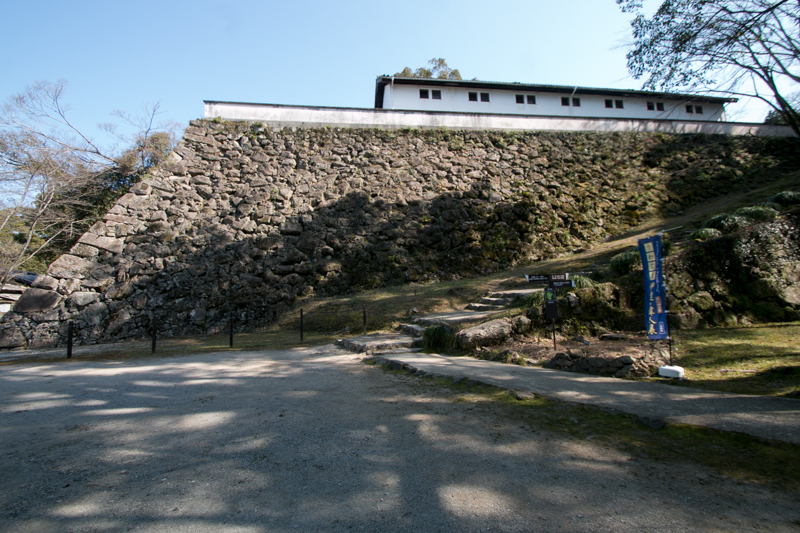 This central area is wholly protected by stone walls, and has a stone-step entrance at the north edge. Secondary area surrounds whole direction of central area as a corridor, also has a low stone wall at whole direction. 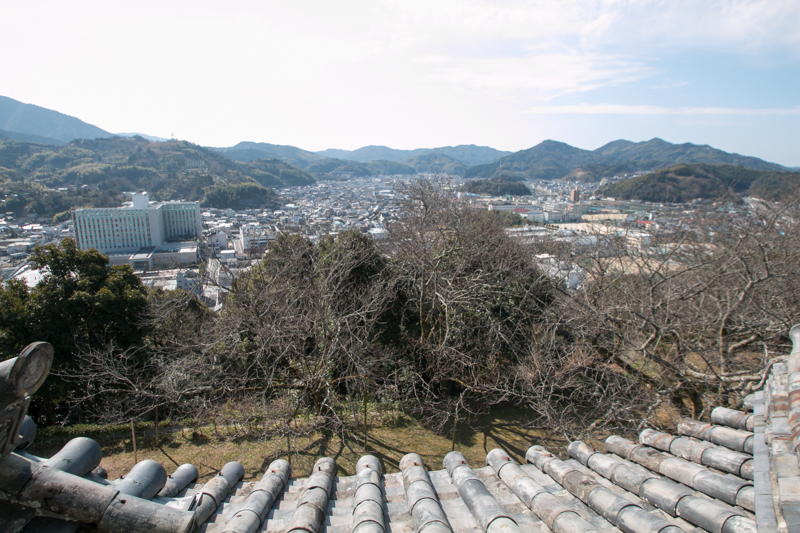 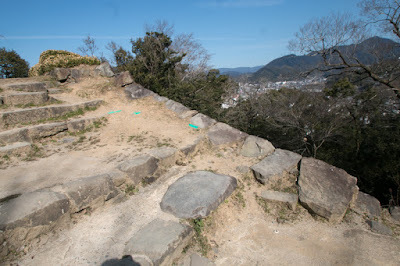 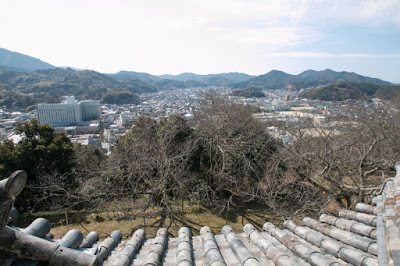 Lower terraces such as Tobeemaru area or Nagatomaru area spreads northwestern slope from central area. 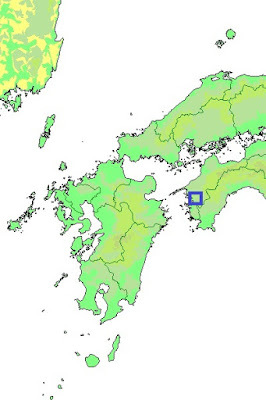 These area are well shaped and large size flat areas, then might be significaltly reformed under Takatora. 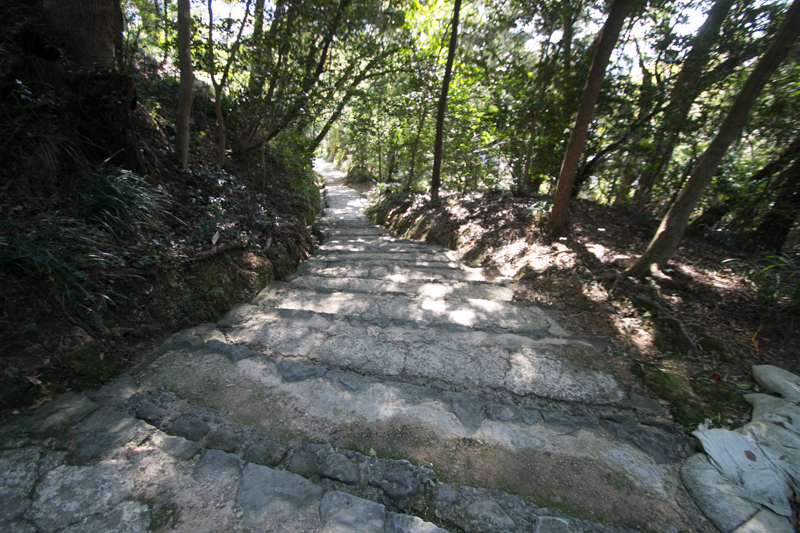 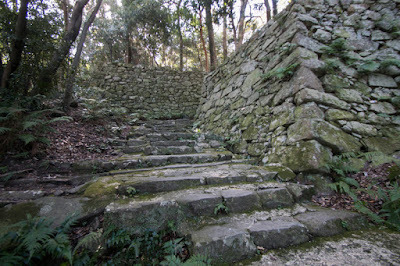 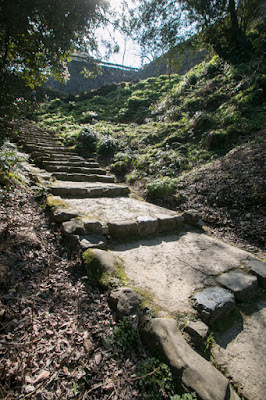 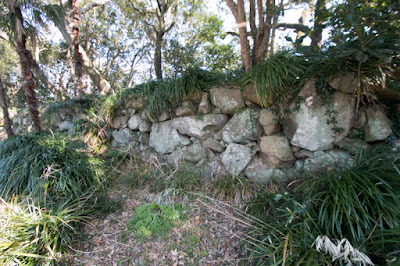 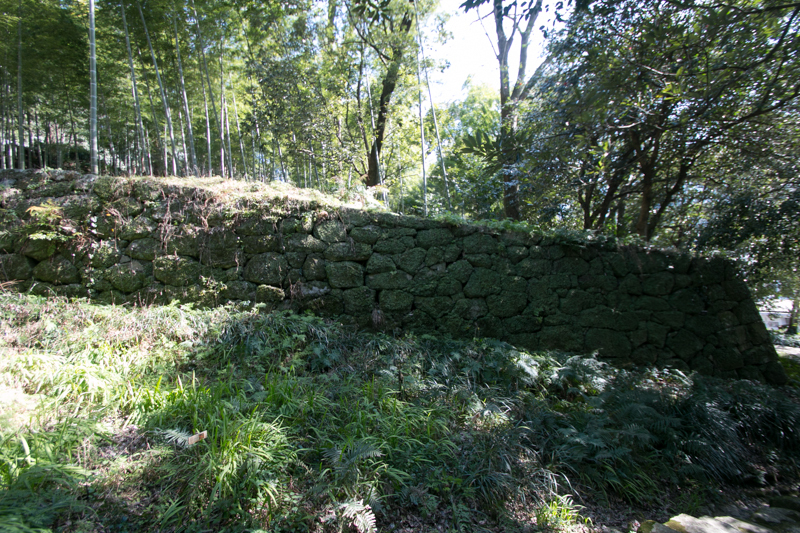 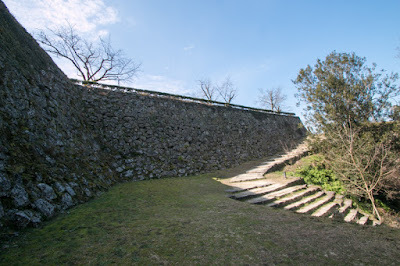 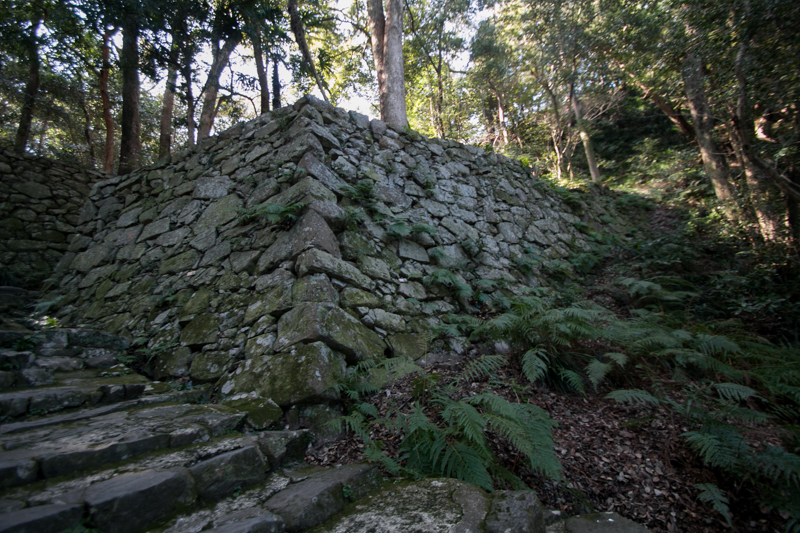 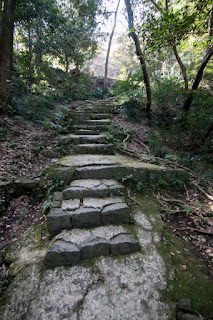 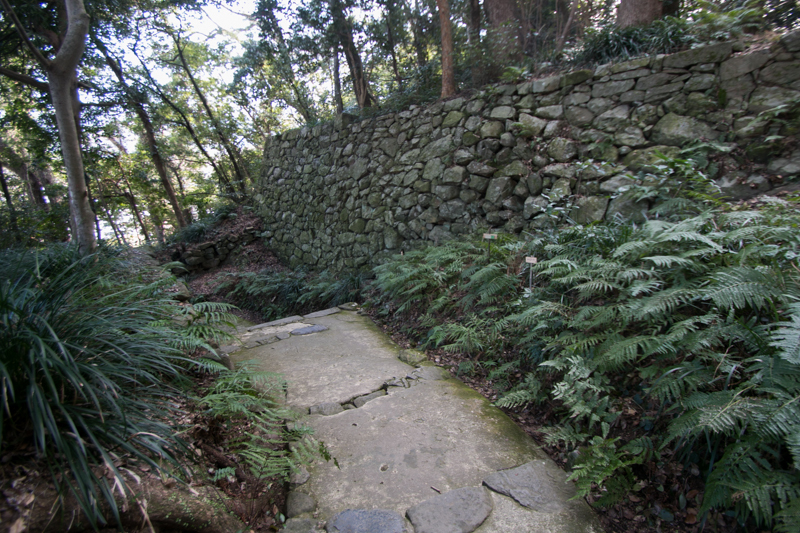 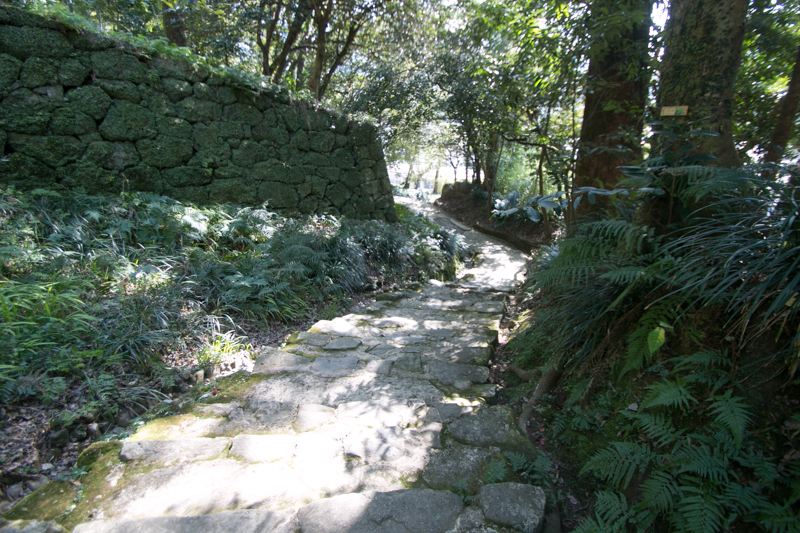 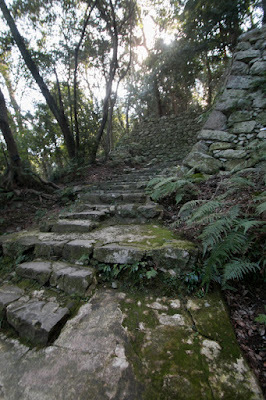 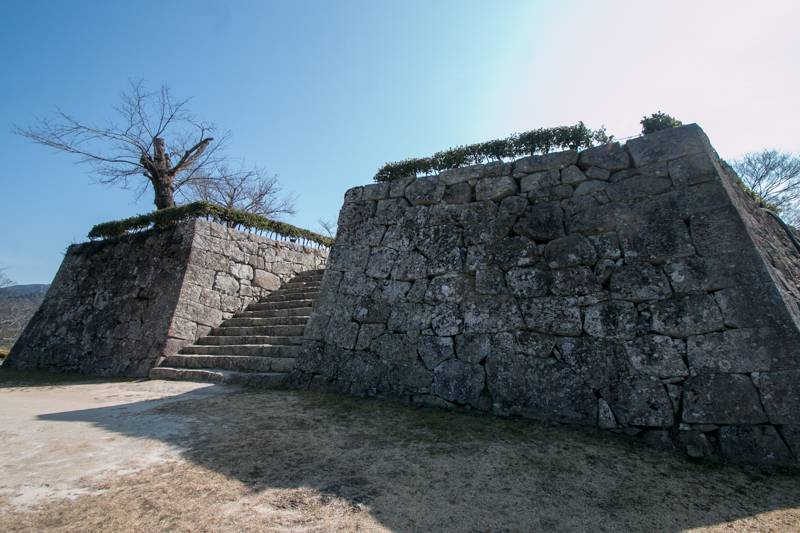 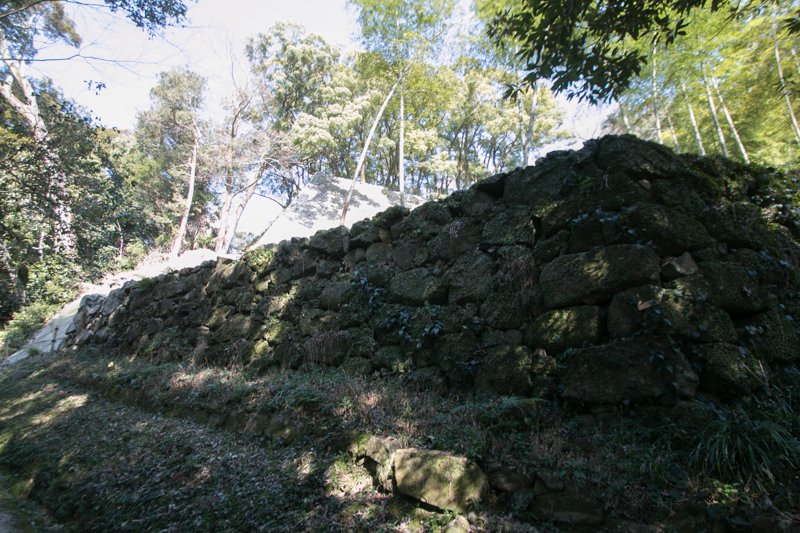 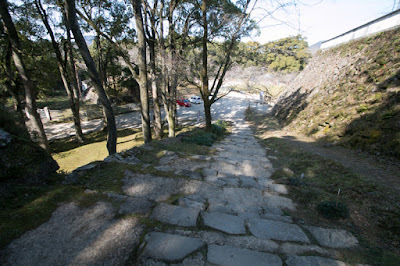 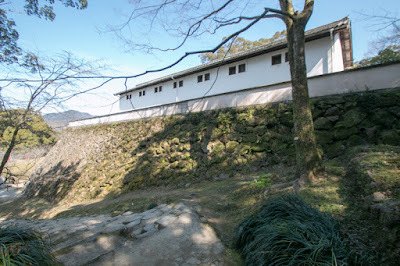 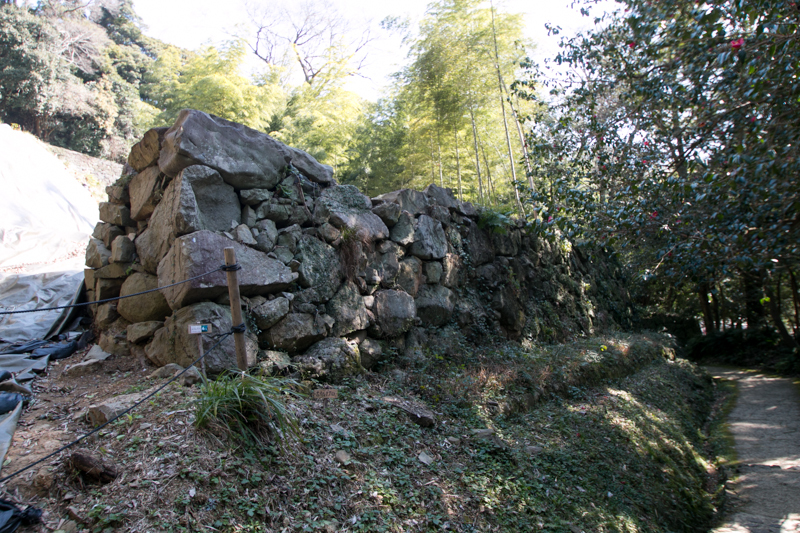 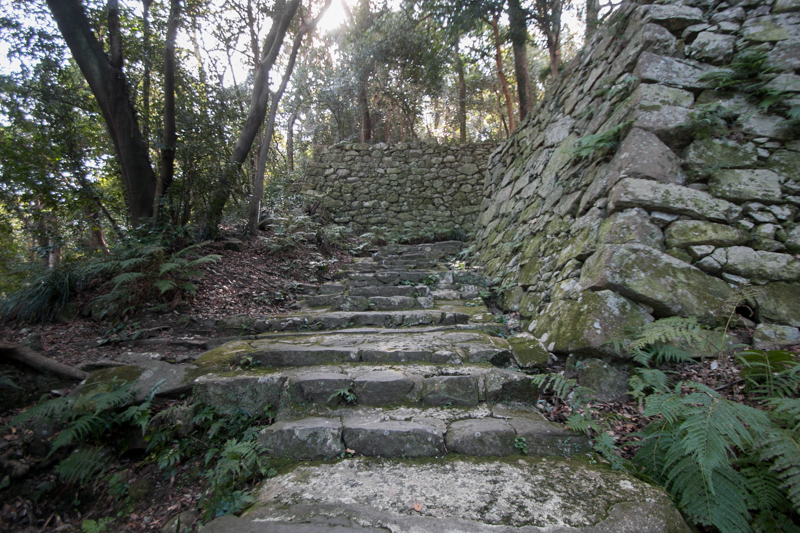 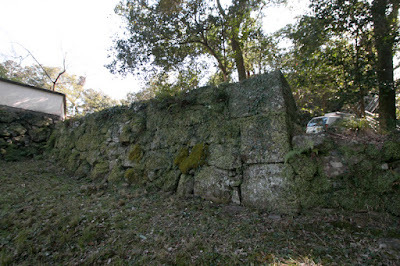 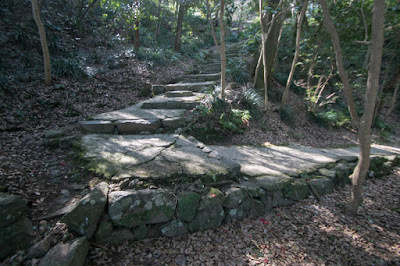 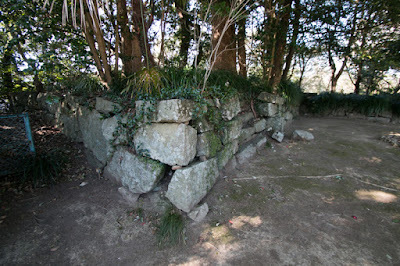 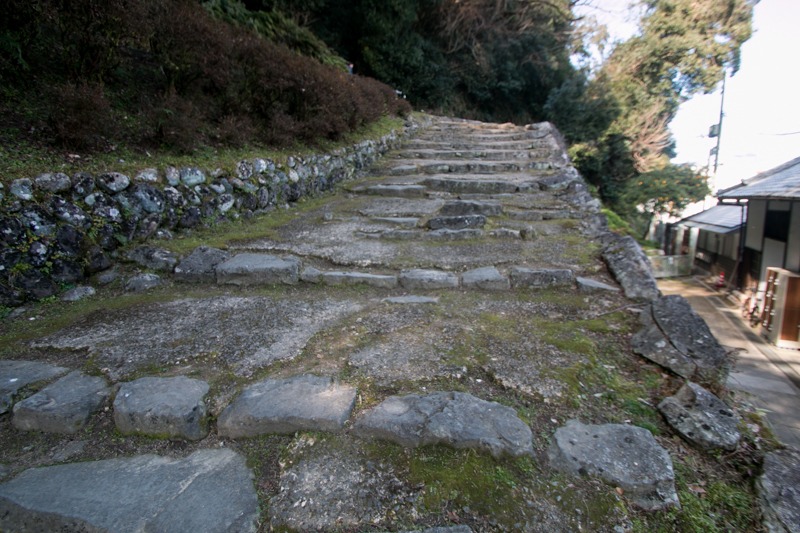 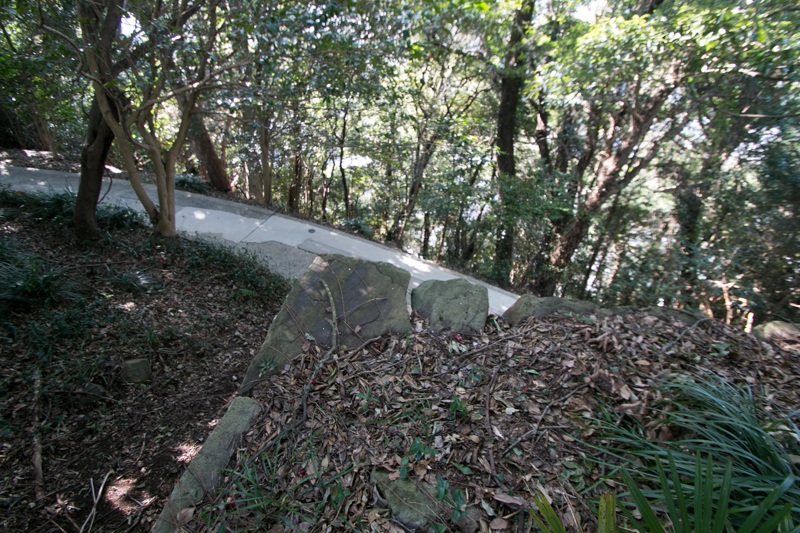 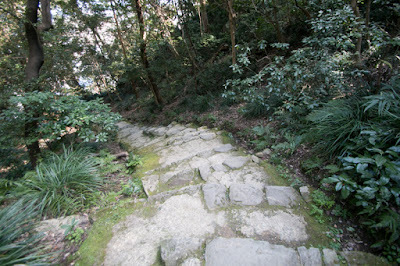 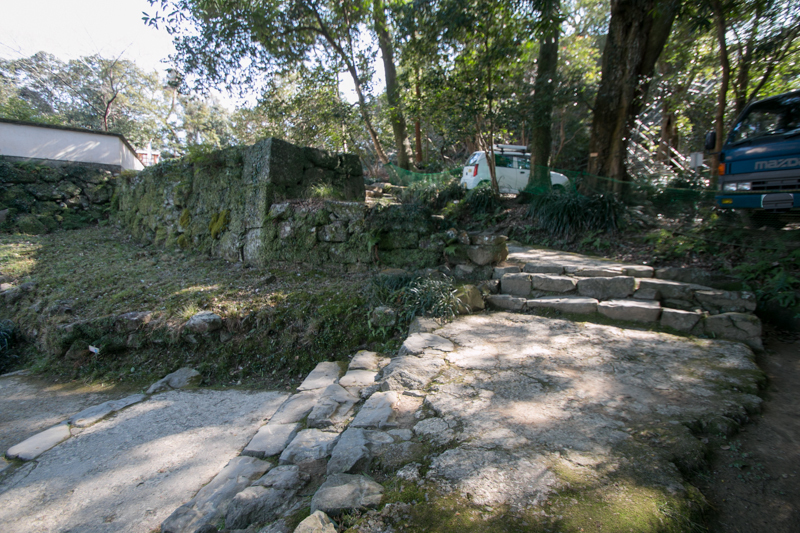 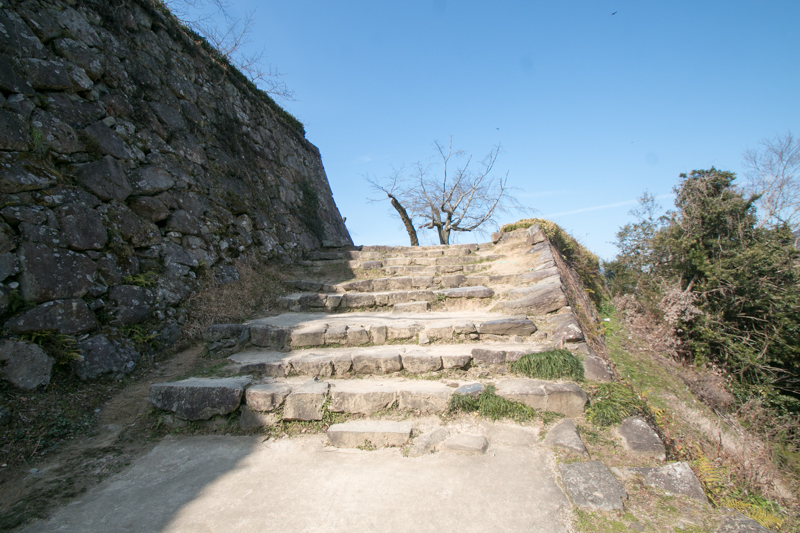 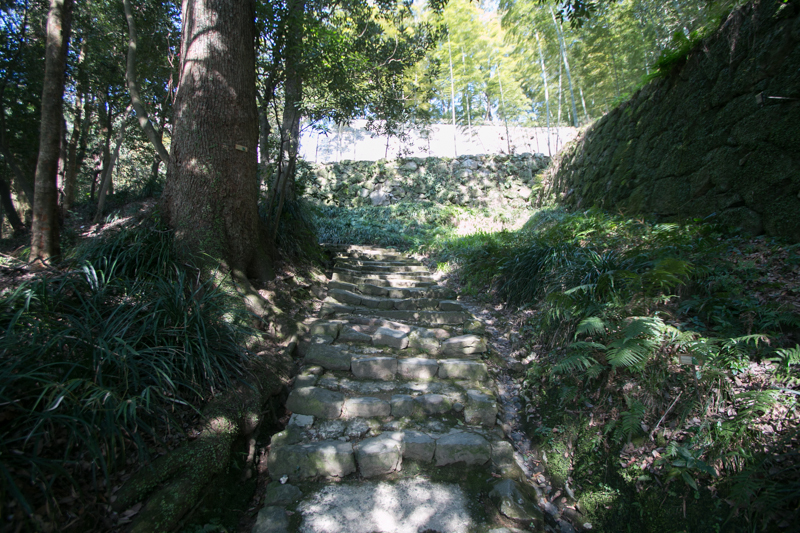 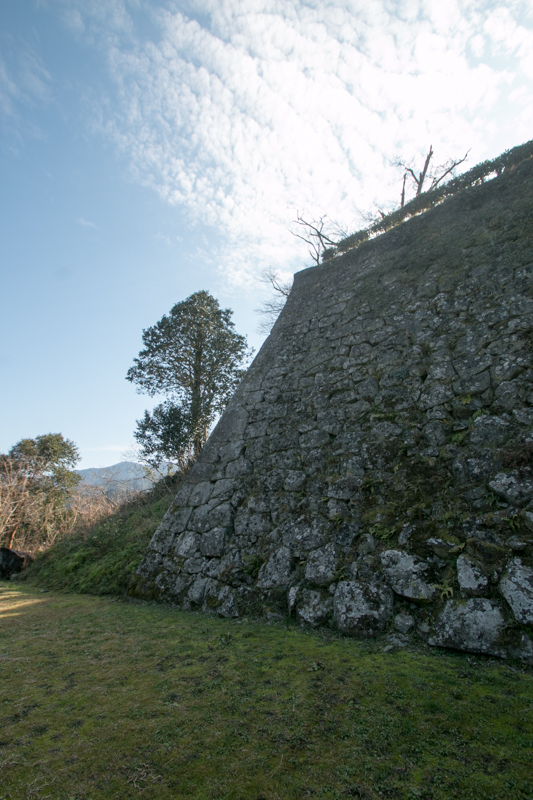 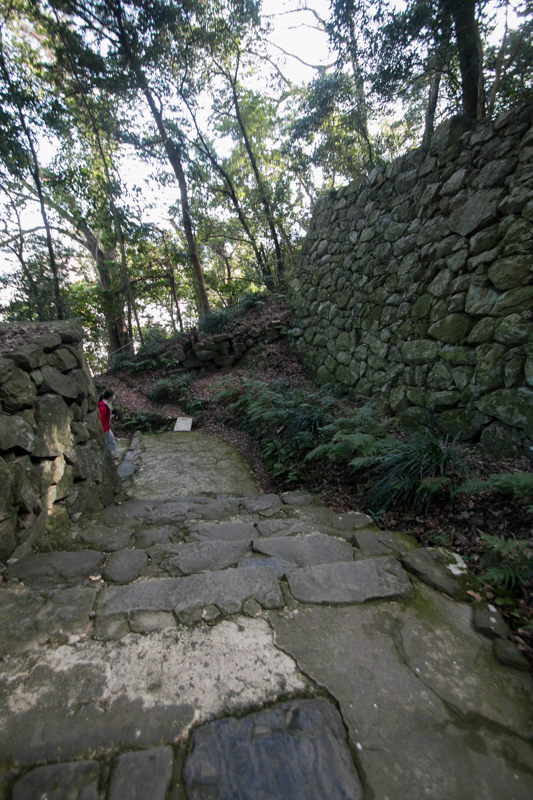 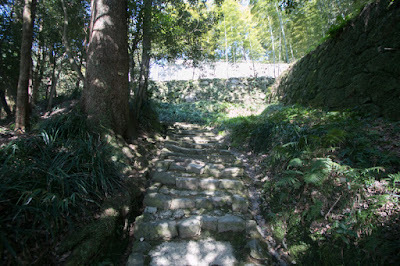 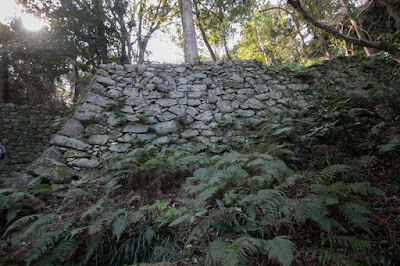 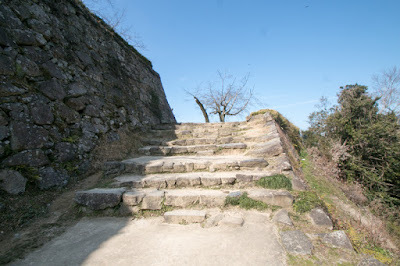 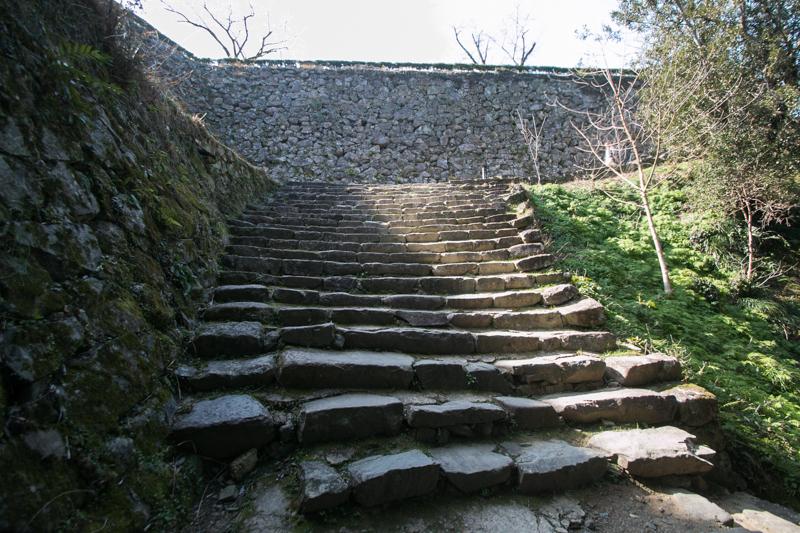 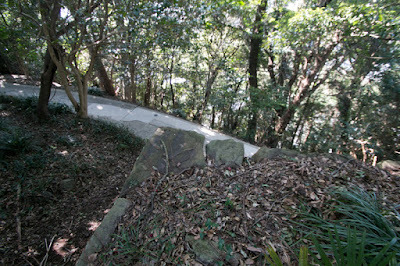 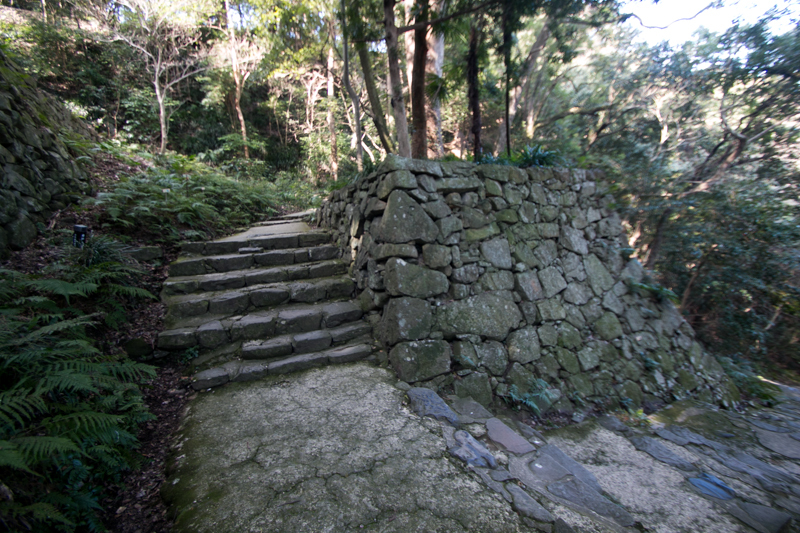 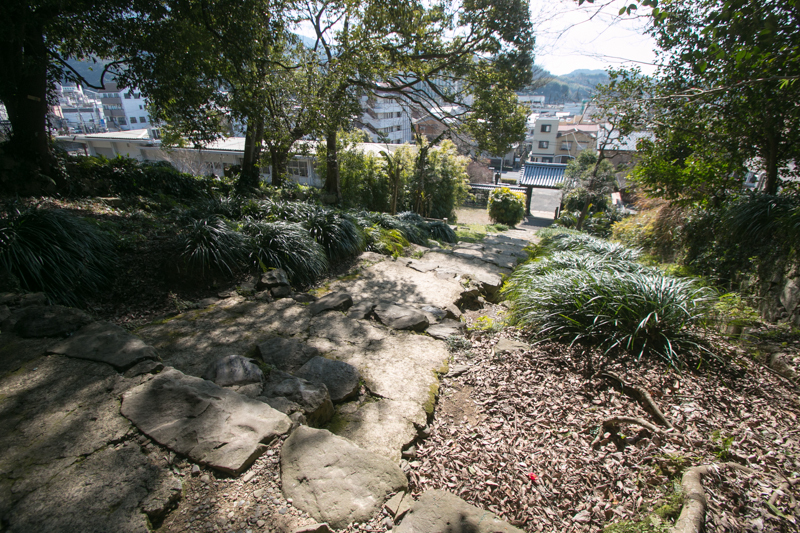 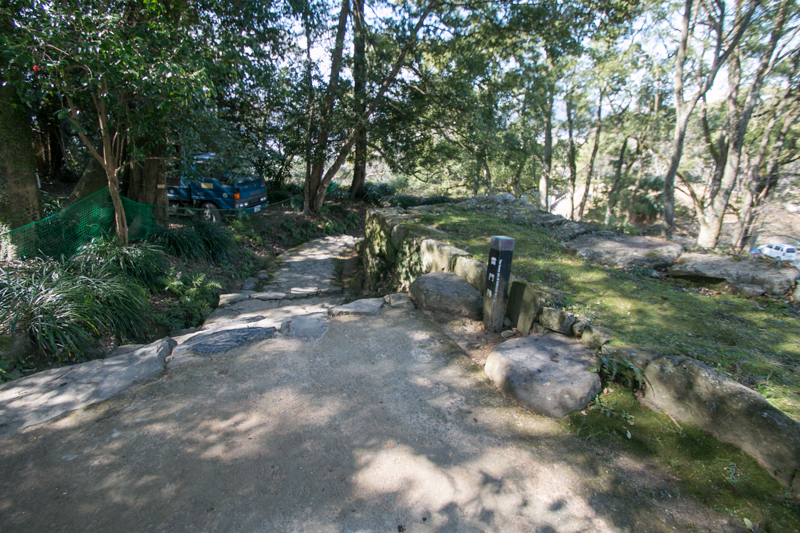 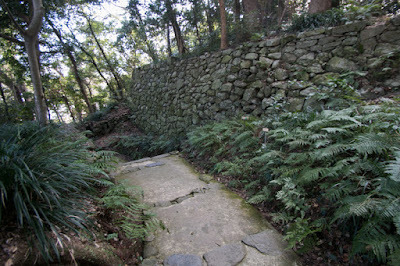 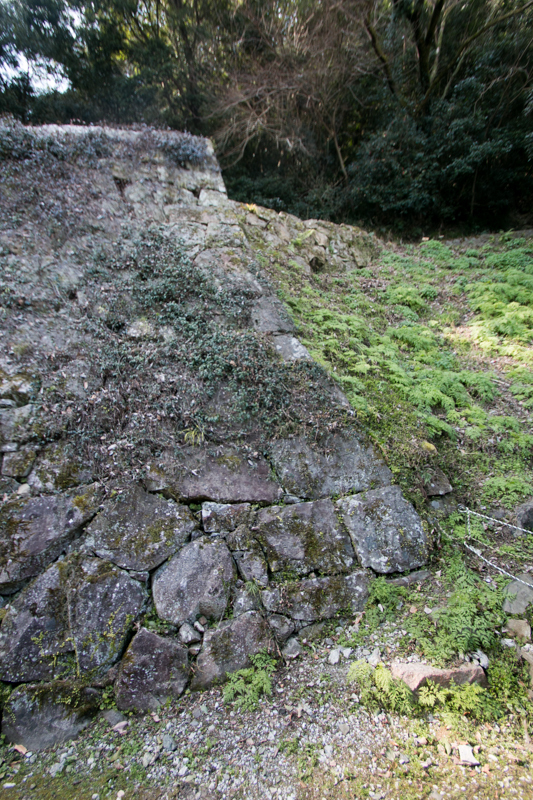 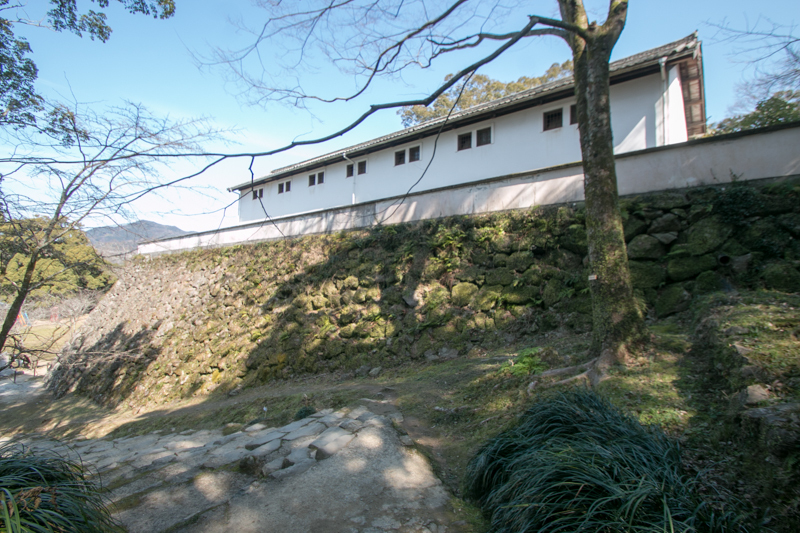 Tall stone wall are built at the slope facing lower area, and a powerful stone slep aside of tall stone wall exist betwee Nagatomaru area, the lowerst layer and Tobeemaru, the middle layer. 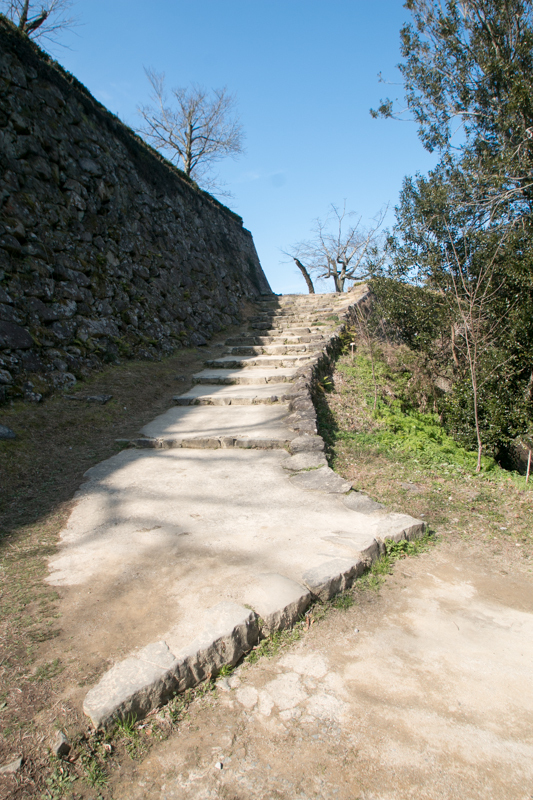 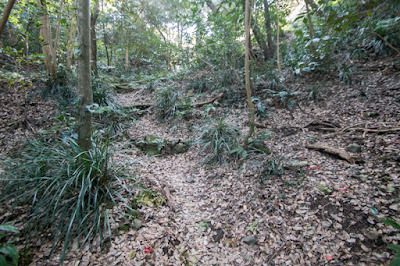 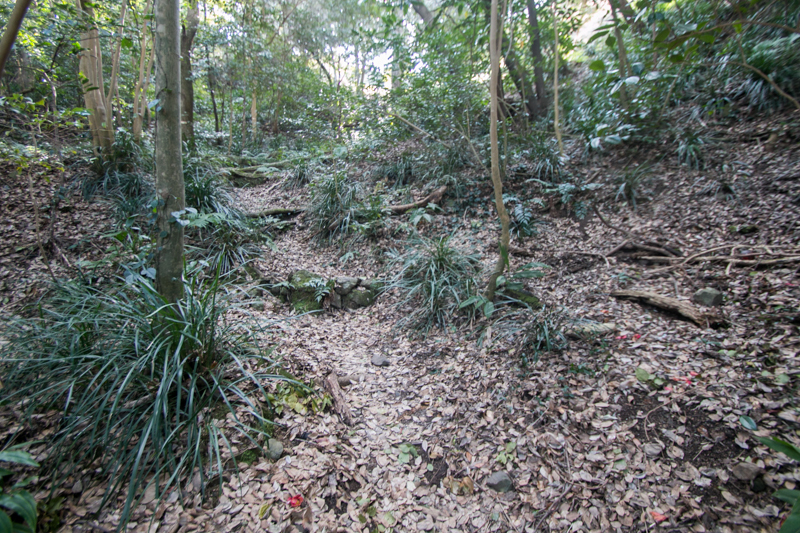 Entrances to castle hill exist at south edge and northeast edge. Southern one might be the original main gate, and large stone steps is built at the entrance. Northeastern one might be expanded later and became new main gate, with the third area worked as a buffer area. The north, east and southward of the castle is separated from external area by water moat, and northwestern ward directly faced the sea with small port. 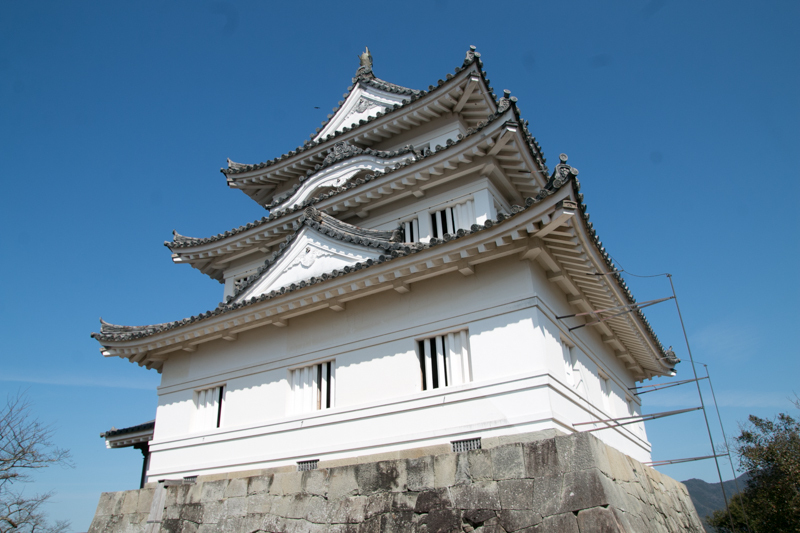 Whole castle structure faces northwest ward, the direction of sea, thus this castle might look beautiful seen from the sea. 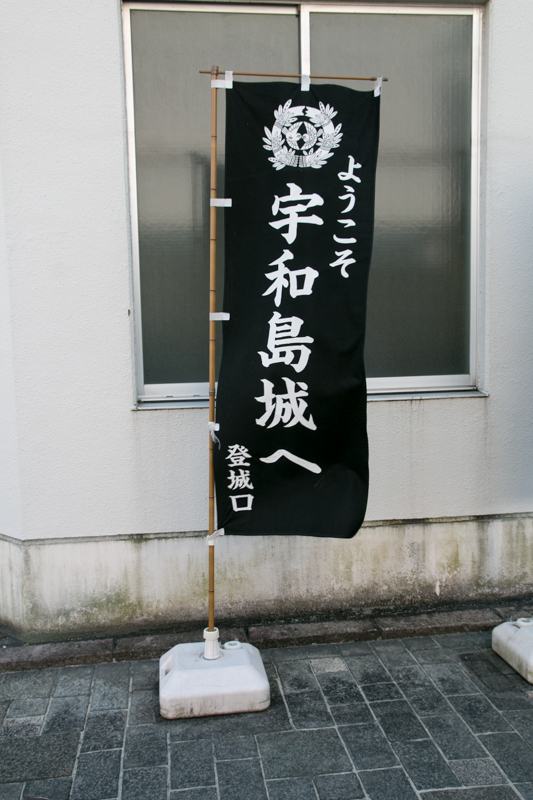 Takatora was also a forward looking man, even though said as an oppotunist. Looking at unstability of Toyotomi government which had Hideyori Toyotomi (1593-1615), an only 6 year child as a successor, Takatora approached to Ieyasu Tokugawa (1543-1616), the largest lord of Kanto region under Toyotomi government. After the death of Hideyoshi, as expected, Ieyasu Tokugawa started to seize the next hegemony, and Mitsunari Ishida (1560-1600), the chief administrative staff of Toyotomi government, tried to stop it. 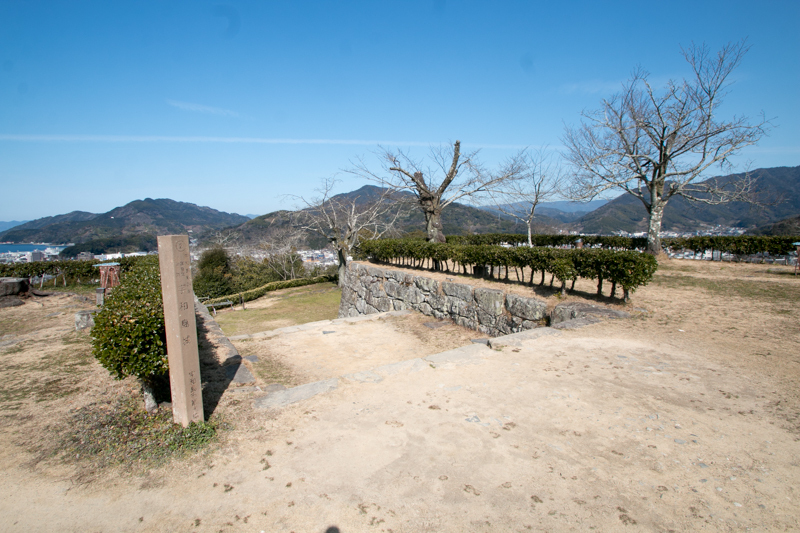 In 1600, Mitsunari raised his army along with other large lords such as Mouri clan or Ukita clan, and both army had a decisive battle at Sekigahara. 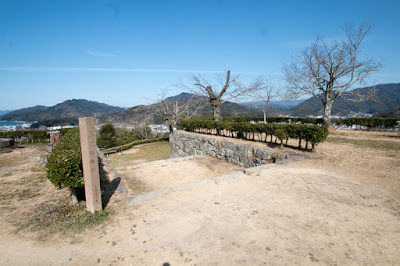 Takatora activiated at political plots beforehand to recruit other lords to Tokugawa side, and also had a fierce fight with Yoshitsugu Otani (1559-1600), a friend of Mitsunari and brave general at the battlefield. After the battle of Sekigahara in 1600, as a reward of his achievement,Takatora held whole Iyo province. 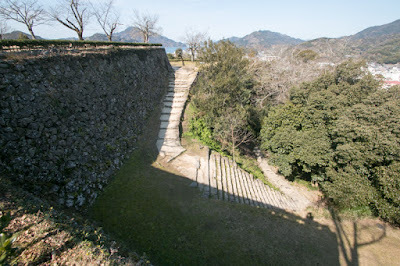 Takatora newly built Imabari castle (Ehime prefecture) at the shore of Setonaikai sea considering control of marine communication, but Uwajima castle and Ozu castle were kept as a major base at south half of the province. 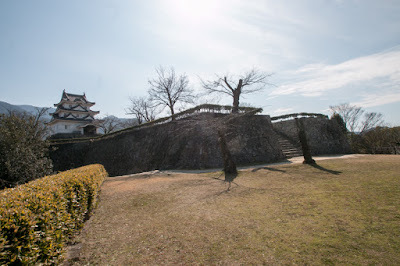 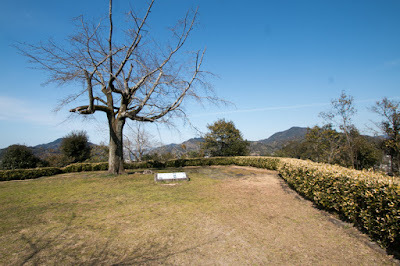 In 1608, Takatora moved to Tsu castle of Ise province (Mie prefecture), and after a while, Hidemune Date (1591-1658) became the lord of Uwajima domain. Hidemune was the eldest son of Masamune Date (1567-1636), a large lord of Sendai castle (Miyagi prefecture) known as a "single-eyed dragon", but Hidemune was born from concubine and there was another younger legitimate son. 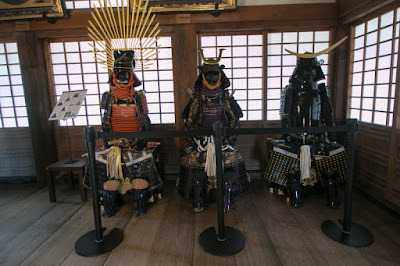 Hidemune couldn’t succeed Sendai domain, but Masamune requested Edo shogunate that Hidemune could have his own domain. 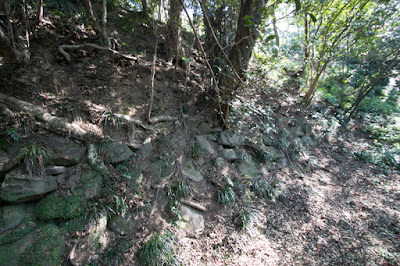 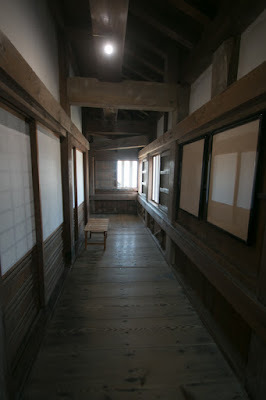 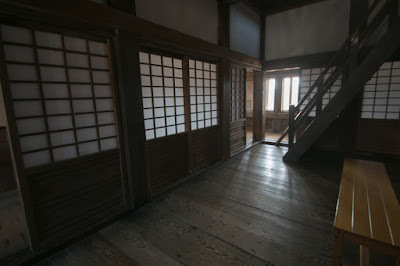 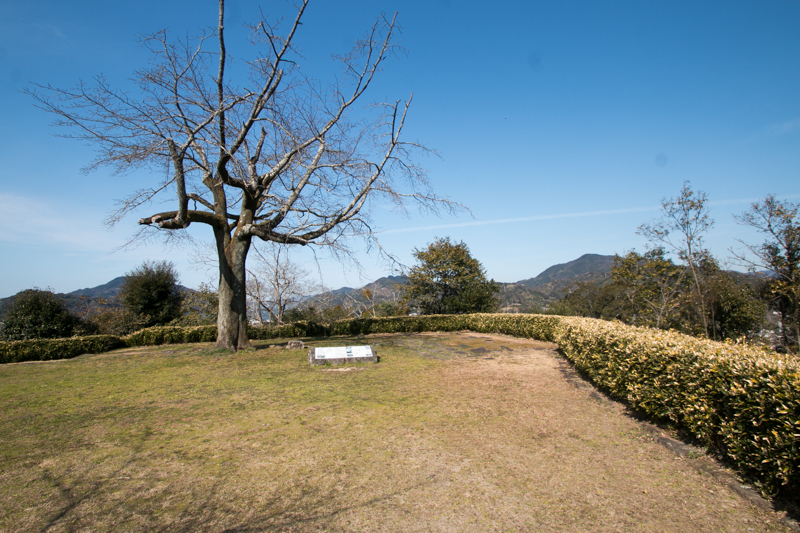 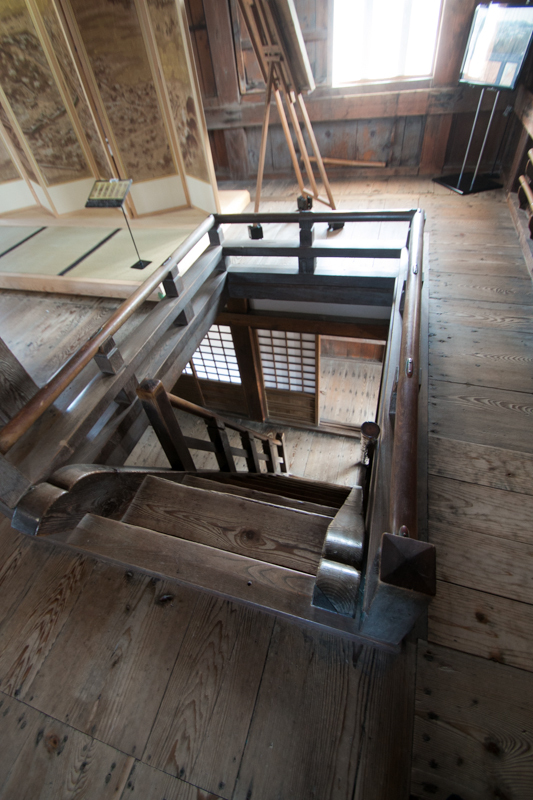 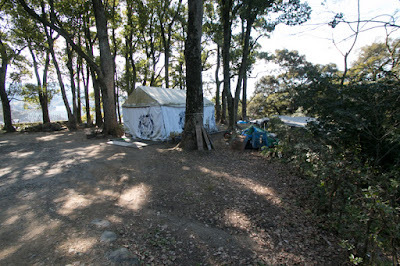 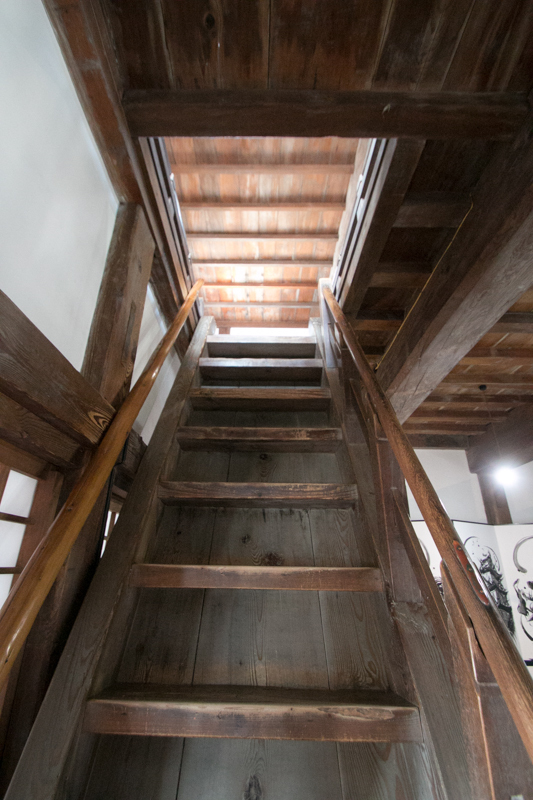 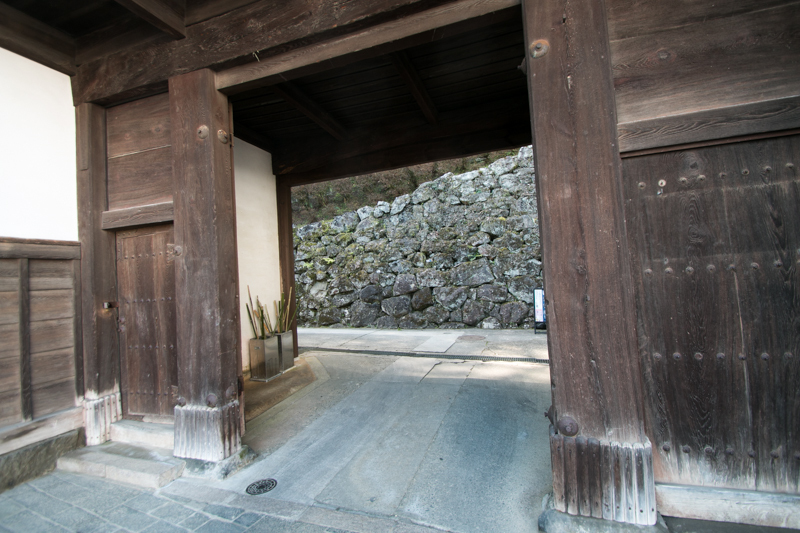 As a result, Hidemune was given this area and established a branch house of Date clan. 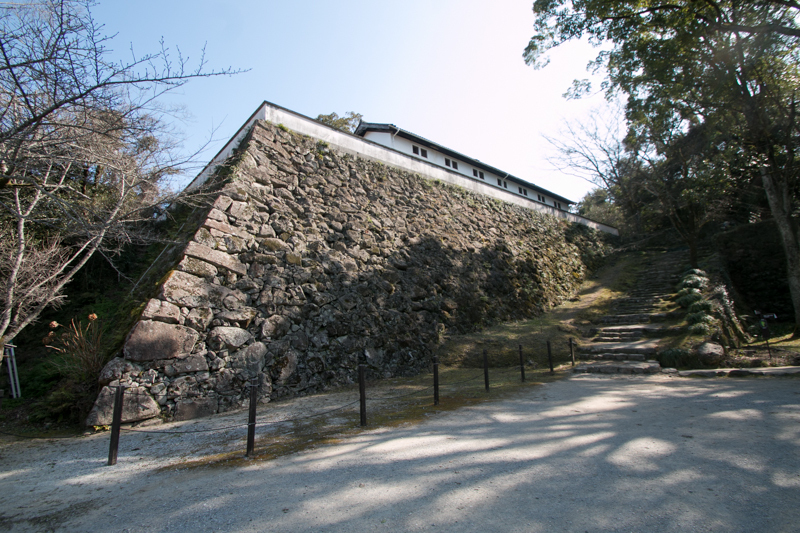 Second lord Munetoshi Date (1635-1709) reformed Uwajima castle, and replaced damaged former main tower to current white one. Date clan had governed Uwajima domain throughout Edo eda, and at the end of Edo period, current leader of Date clan was Munenari Date (1818-1892). 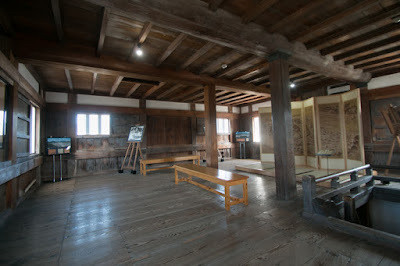 He was a progressive lord and intruduced Western technology to Uwajima domain, such as western style army or build of steam ship. Munenari was said as one of four wise lords in the last period of Edo era along with Shungaku Matsudaira (1828-1890) of Echizen domain, Yodo Yamauchi (1827-1872) of Tosa domain and Nariakira Shimazu (1809-1858) of Satuma domain, and proceeded coordination between Imperial Household and Edo shogunate. Once the trend turned to overthrow of Edo shogunate Uwajima domain kept neutral, but kept an important position in Meiji new government. Subsequent to Meiji revolution all buidings except for Main tower and two gates were broken. Other than two remaining gates main gate was once kept but lost by air bombing in WW2. 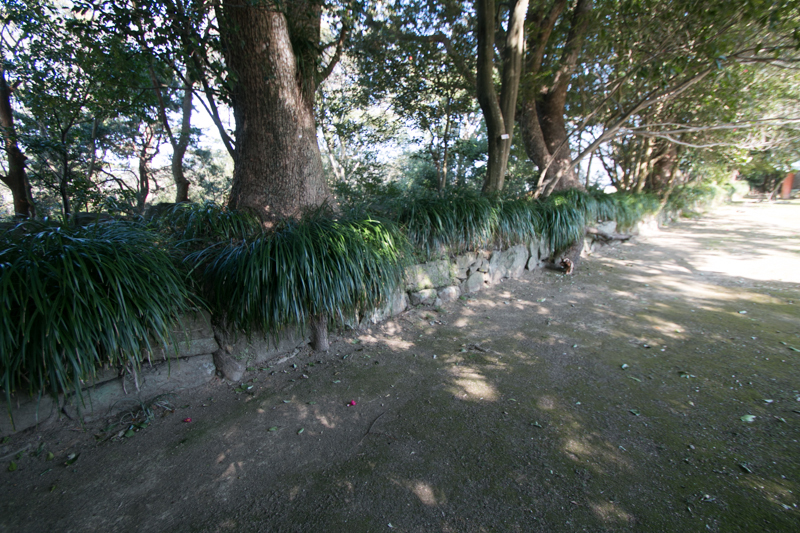 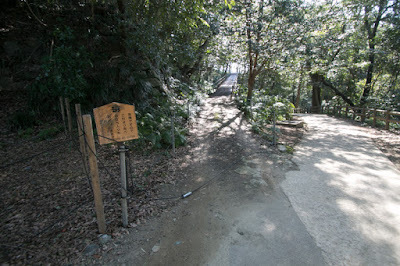 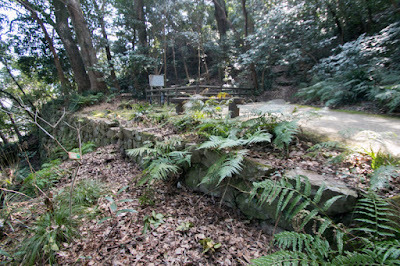 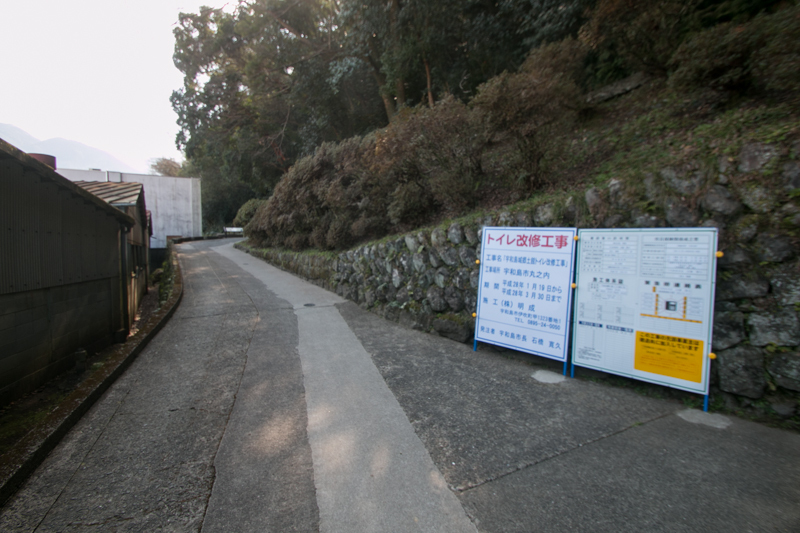 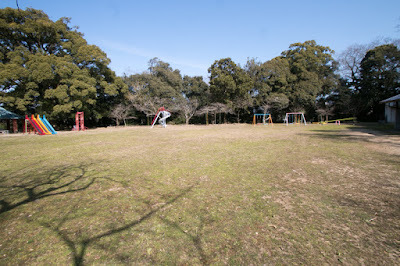 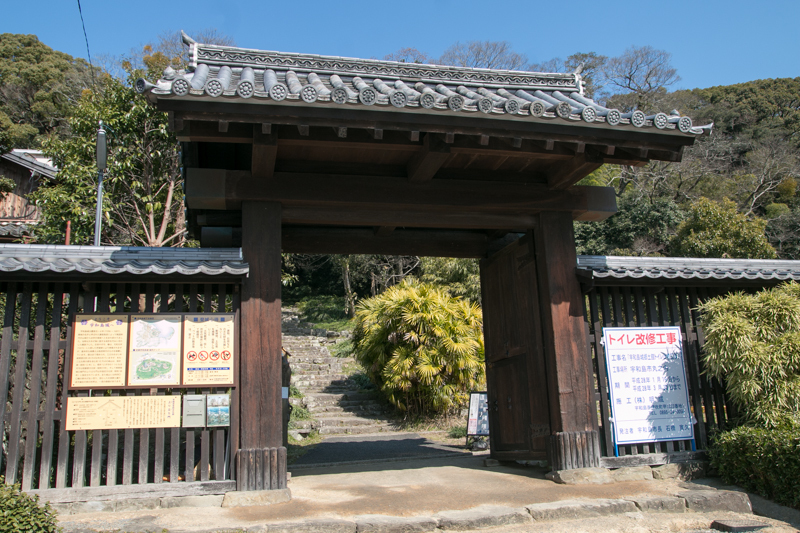 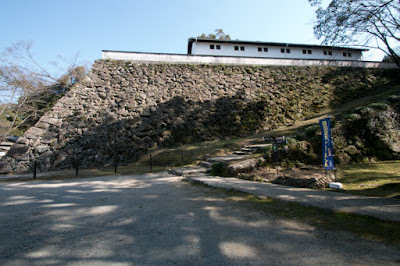 After WW2 the site of the castle is used as a park, and a gate with barrack formerly used as a house of upper samurai was transferred to the place of former main gate. 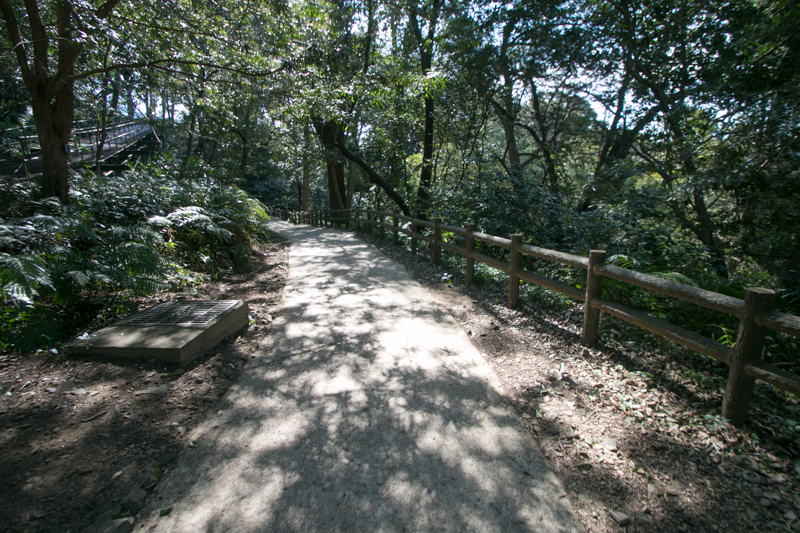 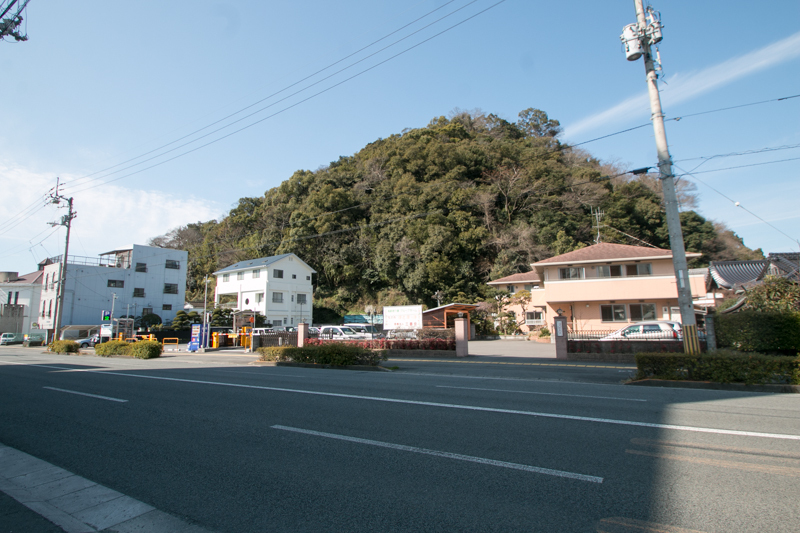 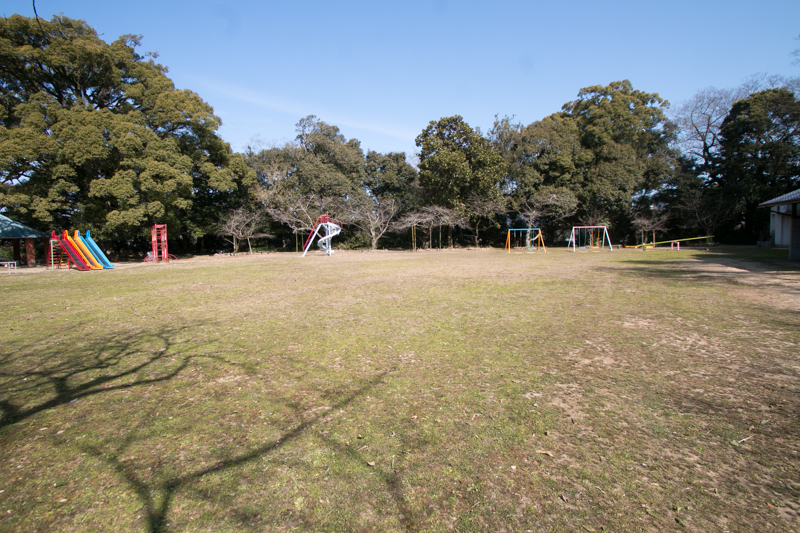 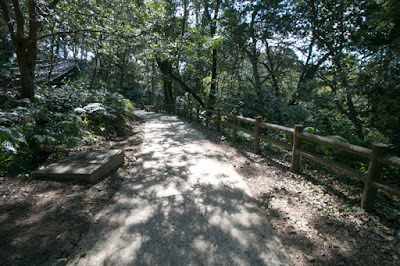 20 minutes walk from JR Shikoku Yosan Honsen line Uwajima station. 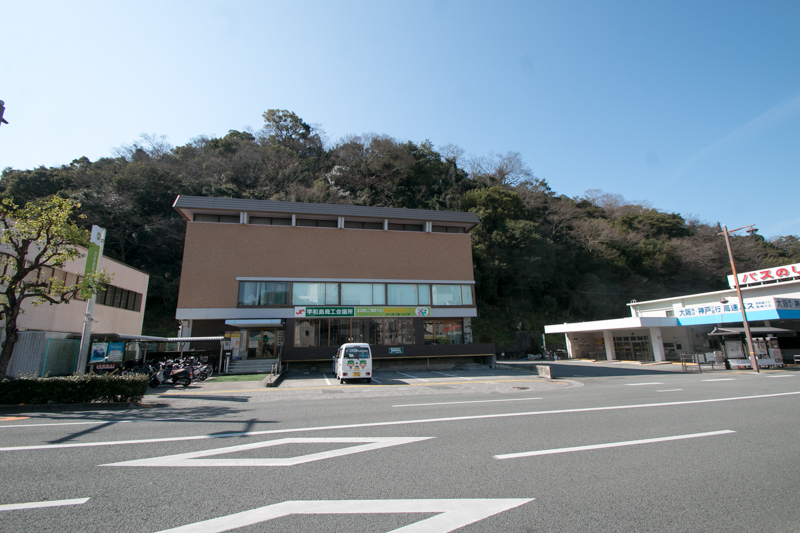 15 minutes drive from Matsuyama Jidoshado Expressway Uwajima-Asahi interchange. 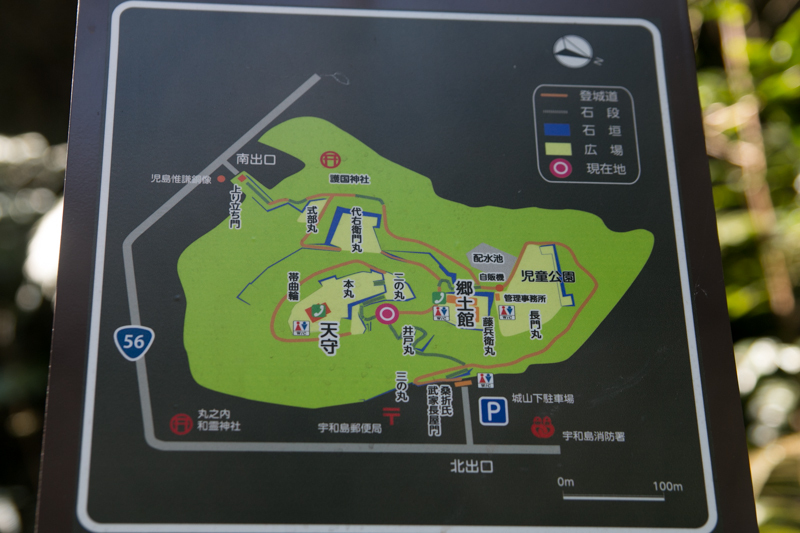 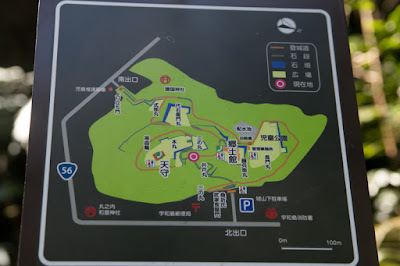 20 minutes walk from hillside entrance to hilltop castle.